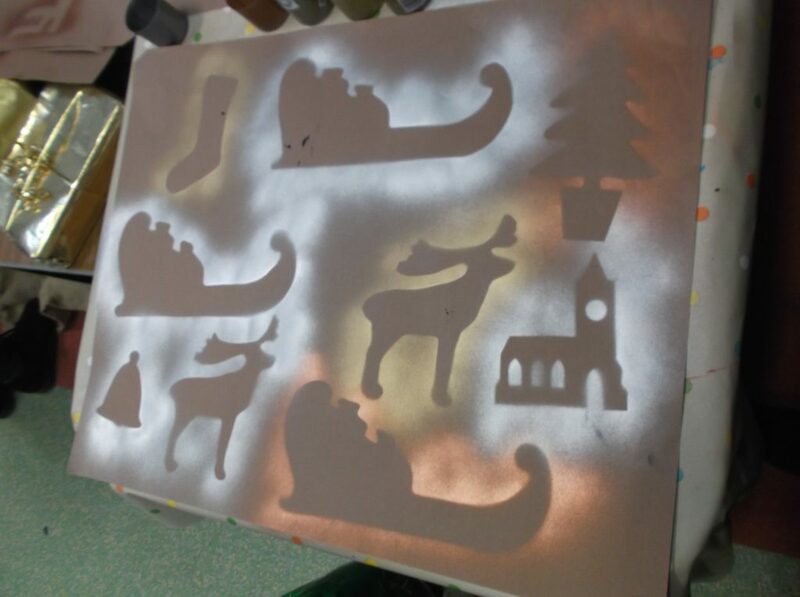 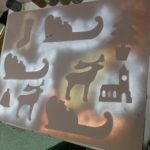 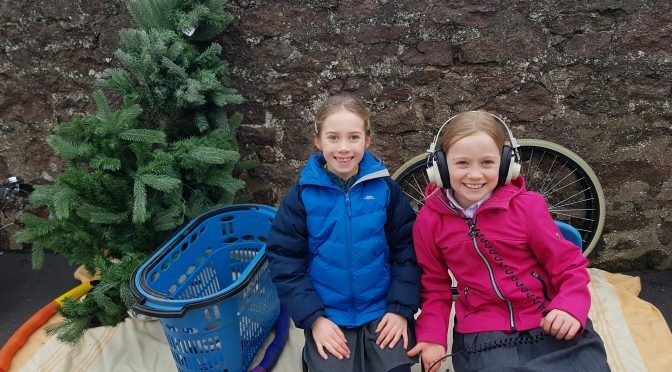 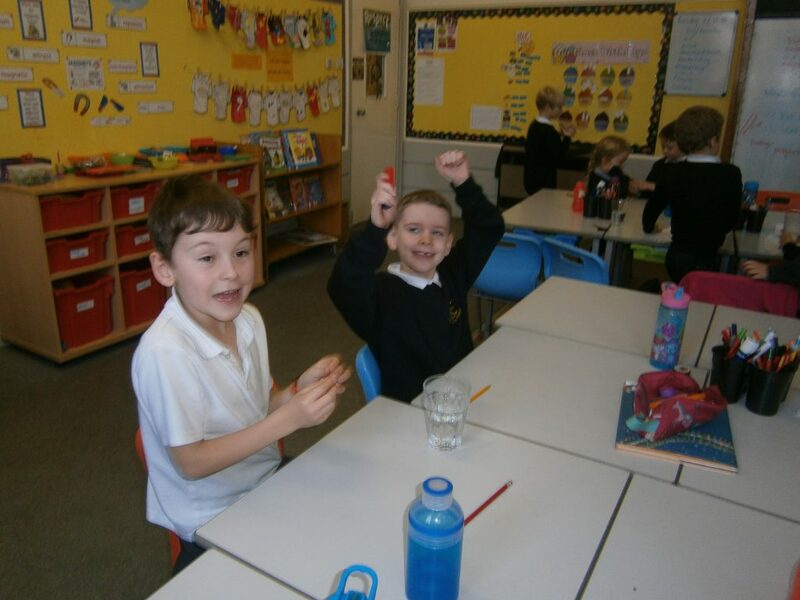 It’s been very very busy in P1 with the run up to Christmas… the Nativity, the Fair, the Lunch and next week the Party and Church Service! 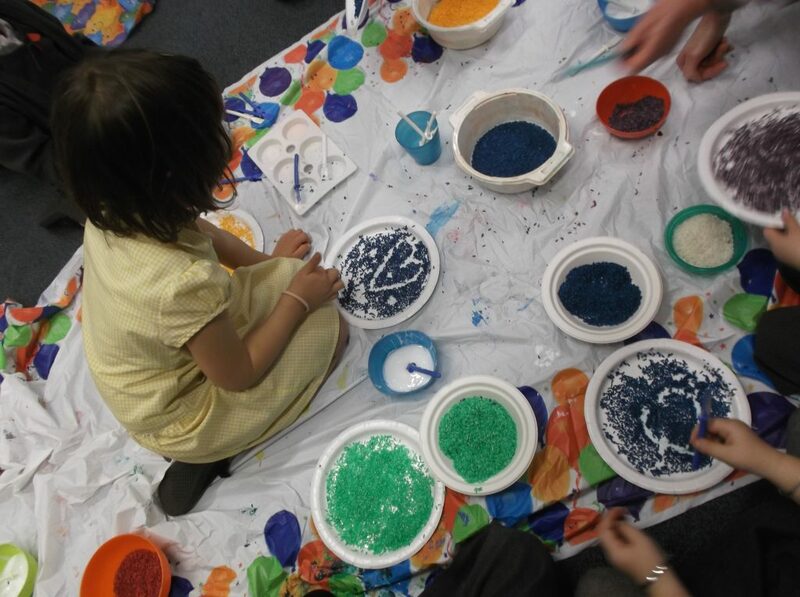 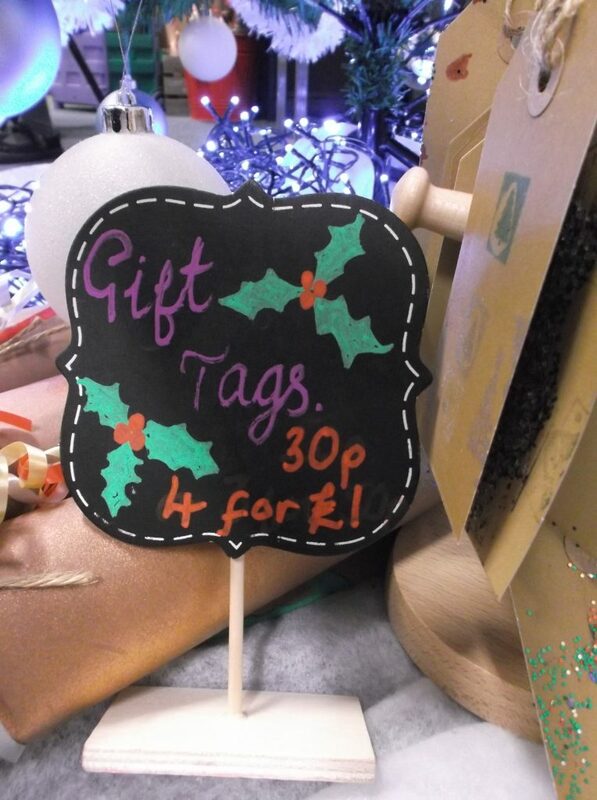 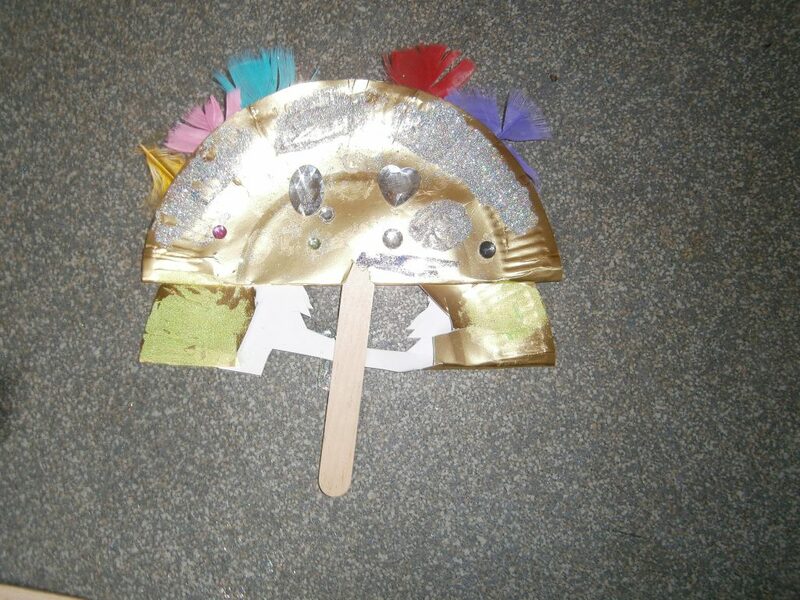 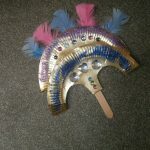 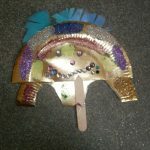 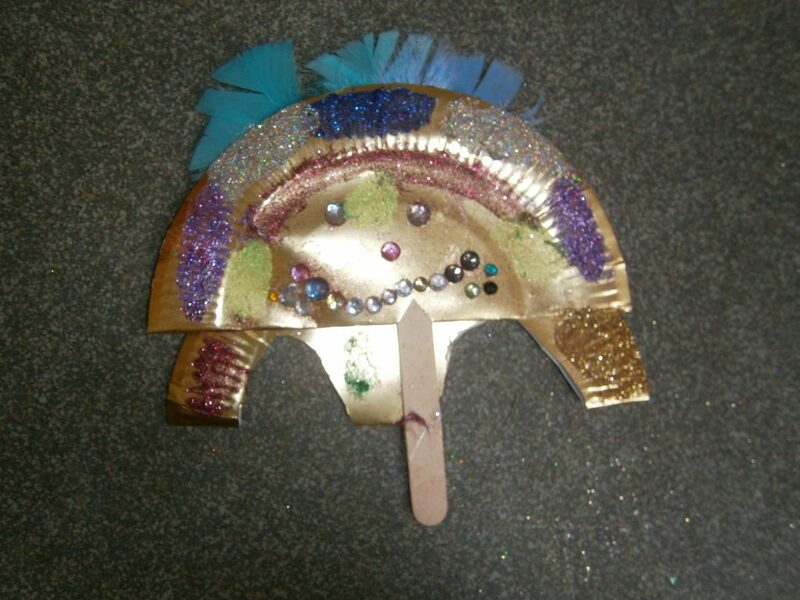 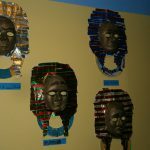 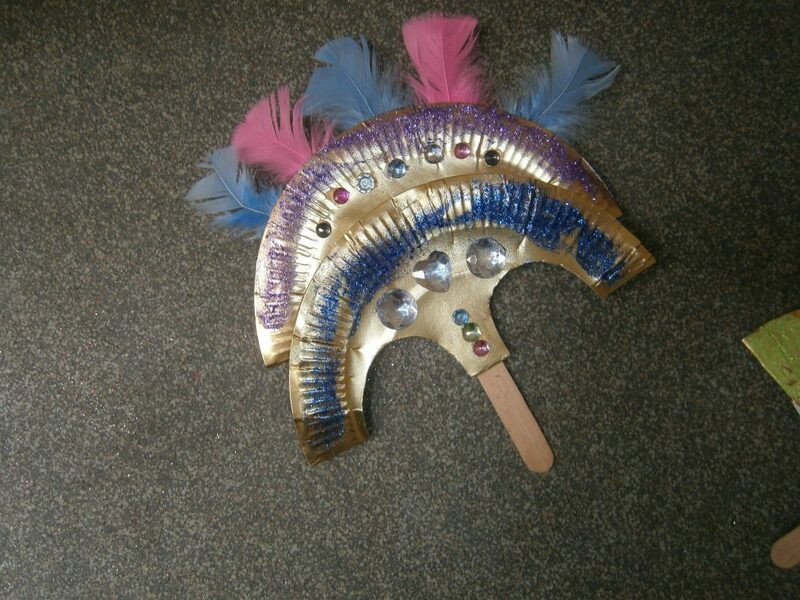 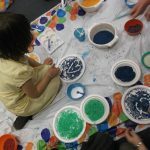 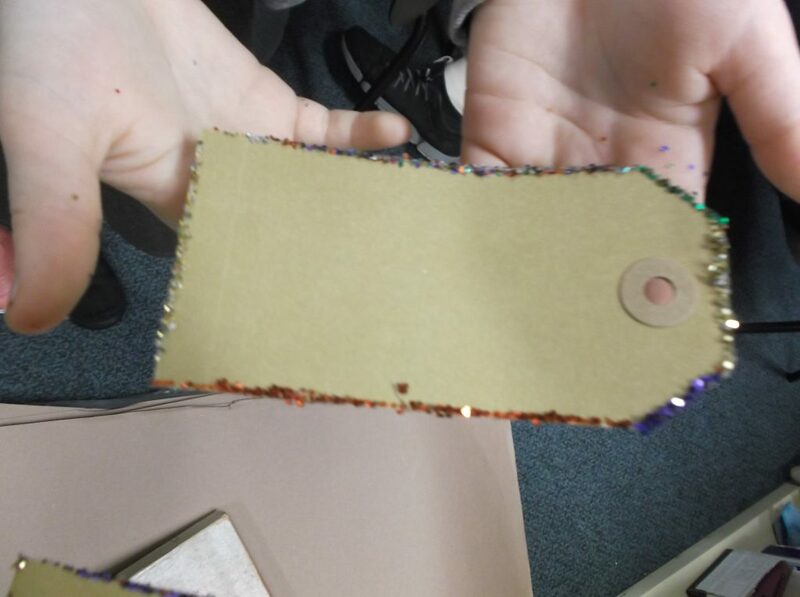 But we have even managed to squeeze in creating a few crafts to sell at tomorrow’s fair! 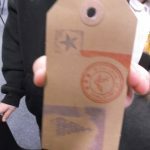 Hopefully everyone now knows the time that your children will be manning our stalls from the stickers yesterday. 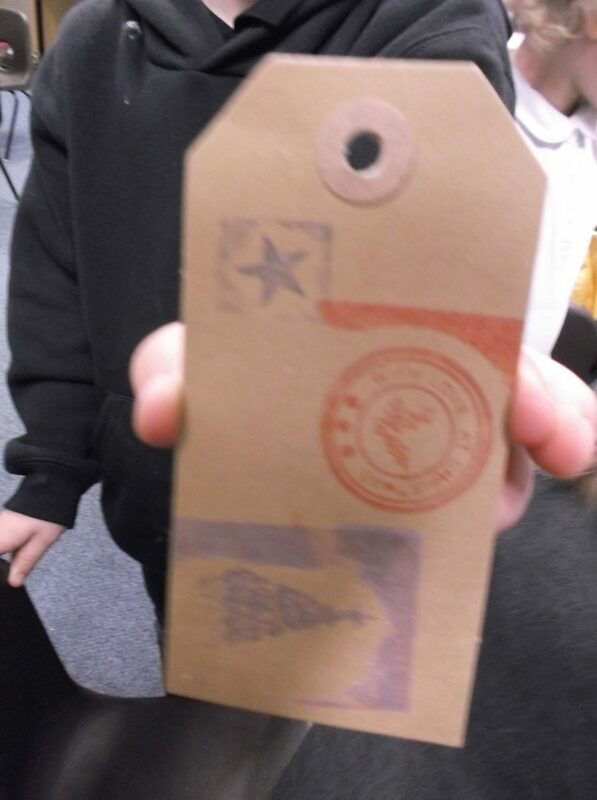 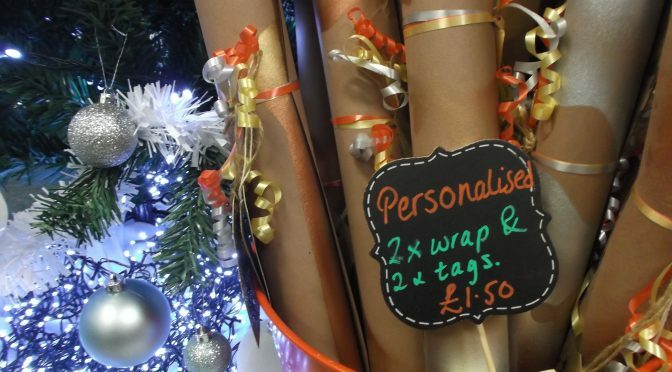 We have worked very hard to create some beautiful handmade, bespoke and unique wrapping paper and gift tags! 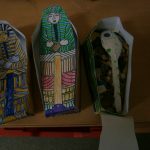 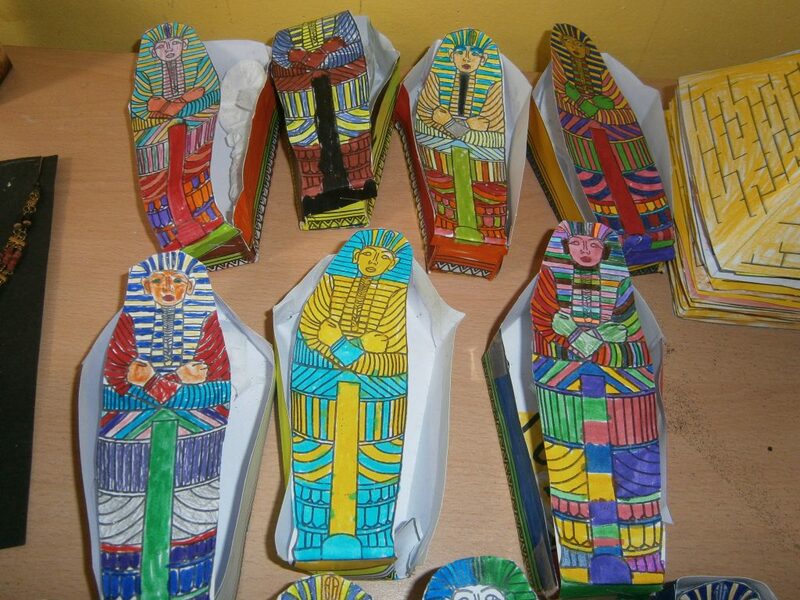 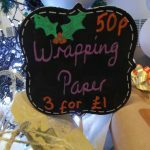 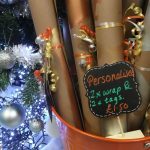 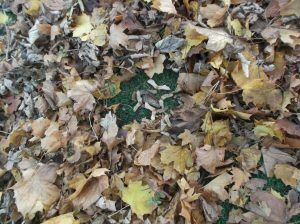 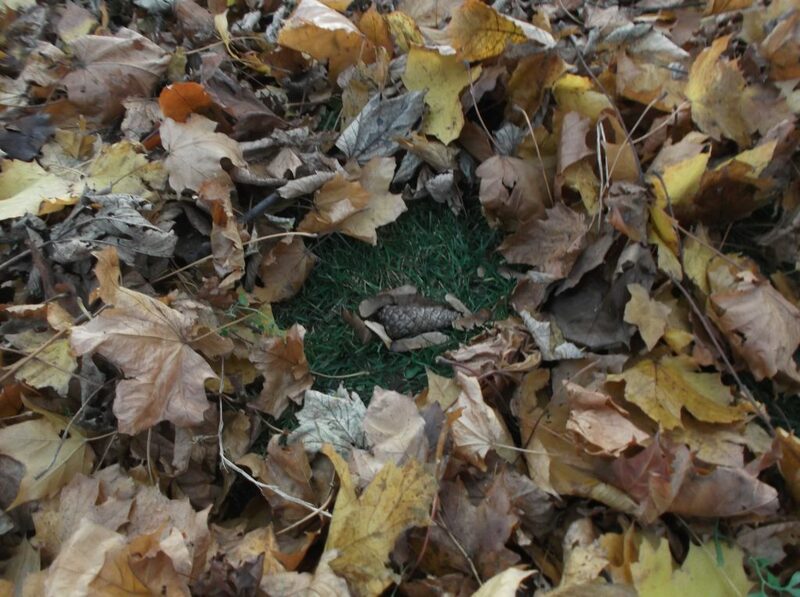 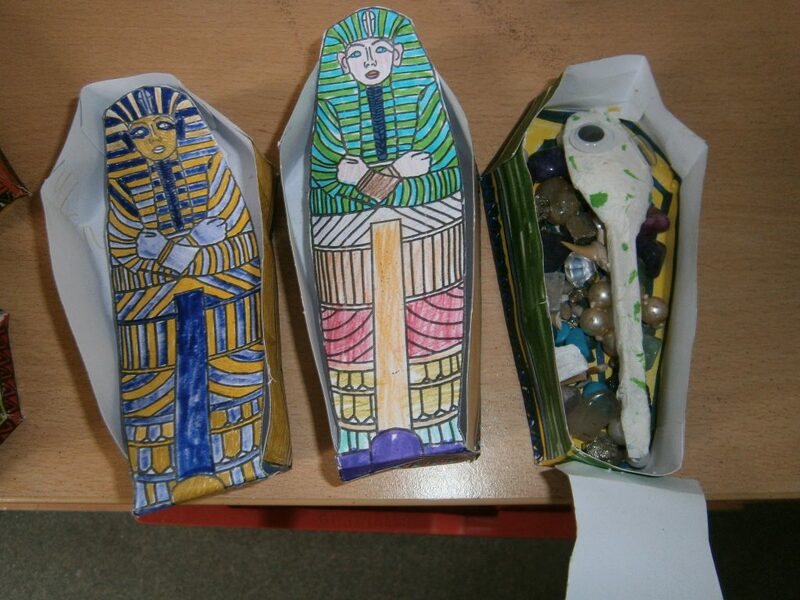 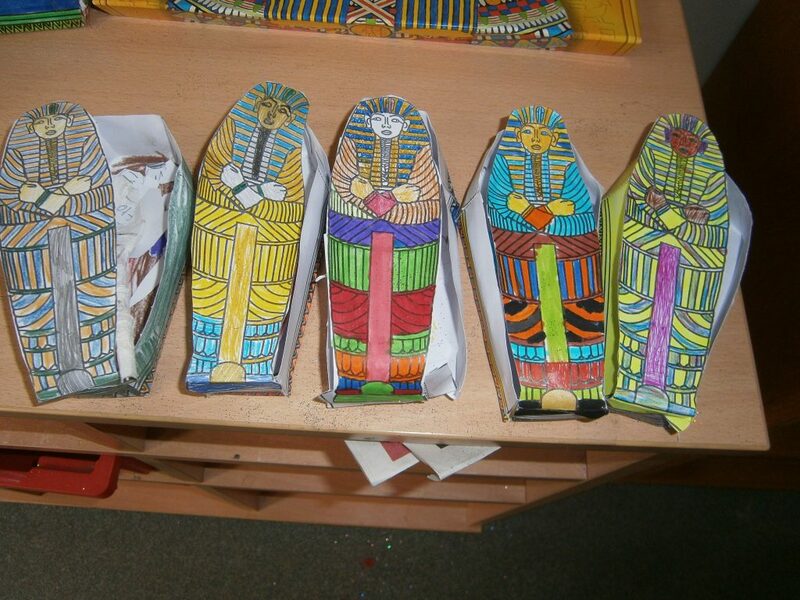 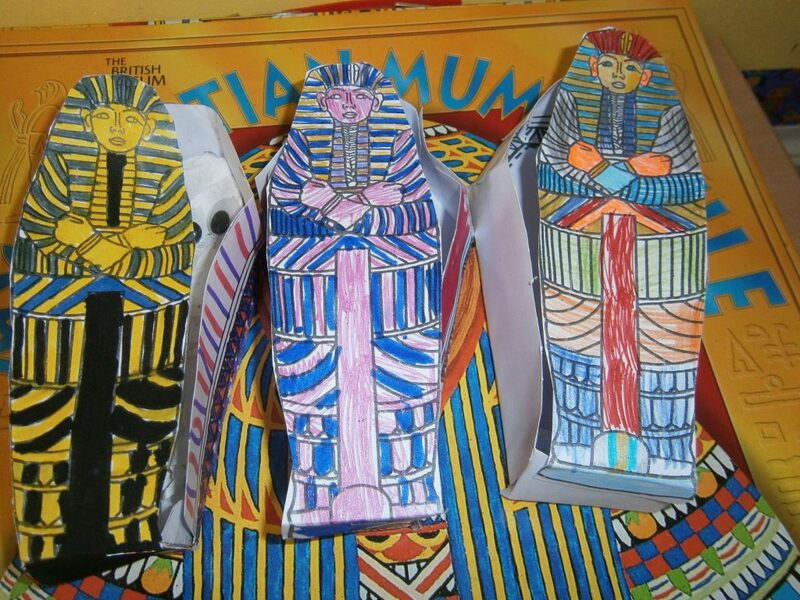 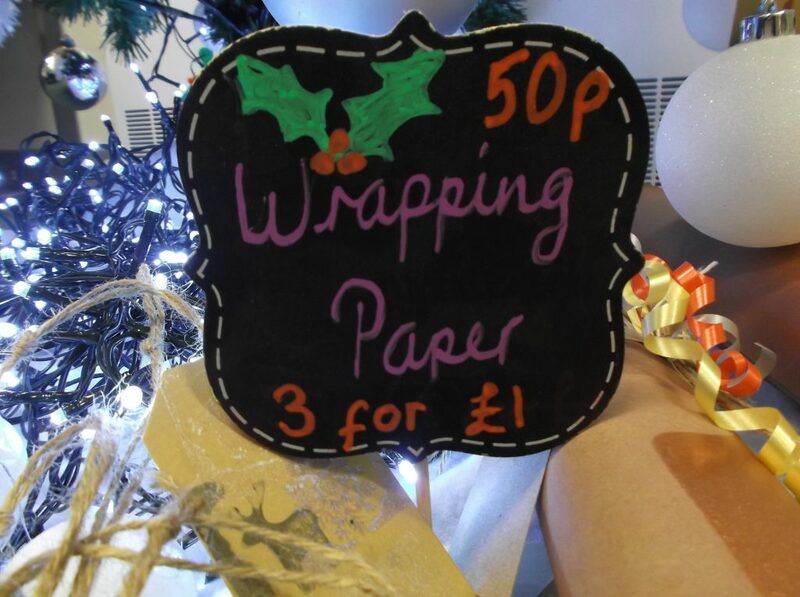 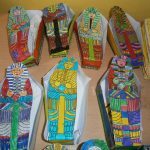 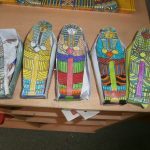 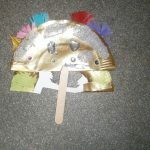 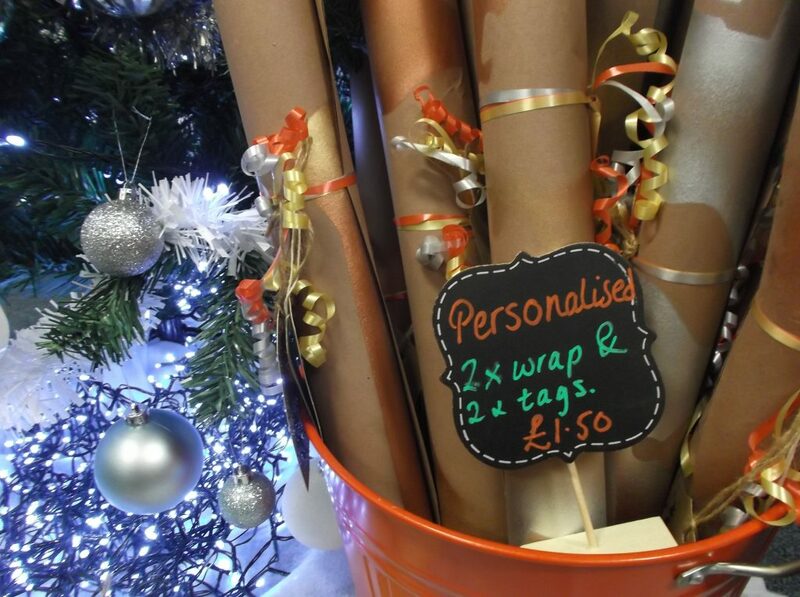 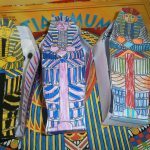 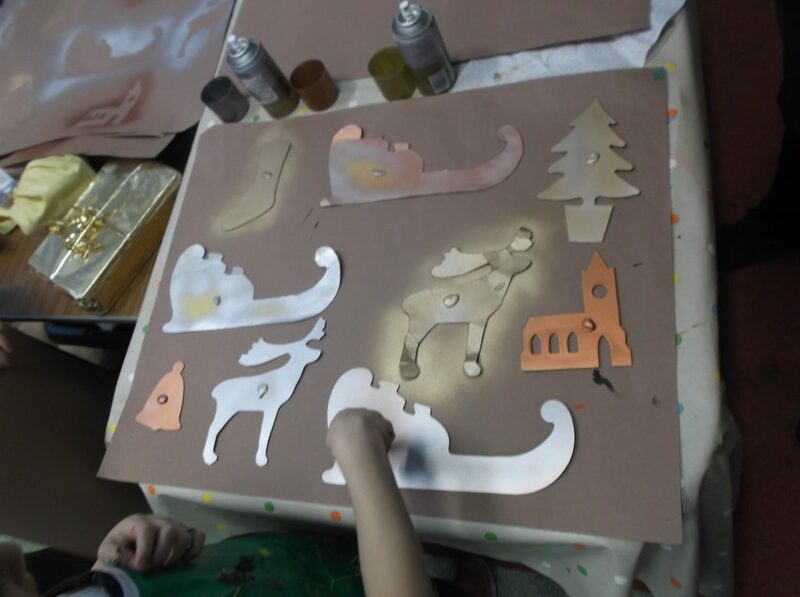 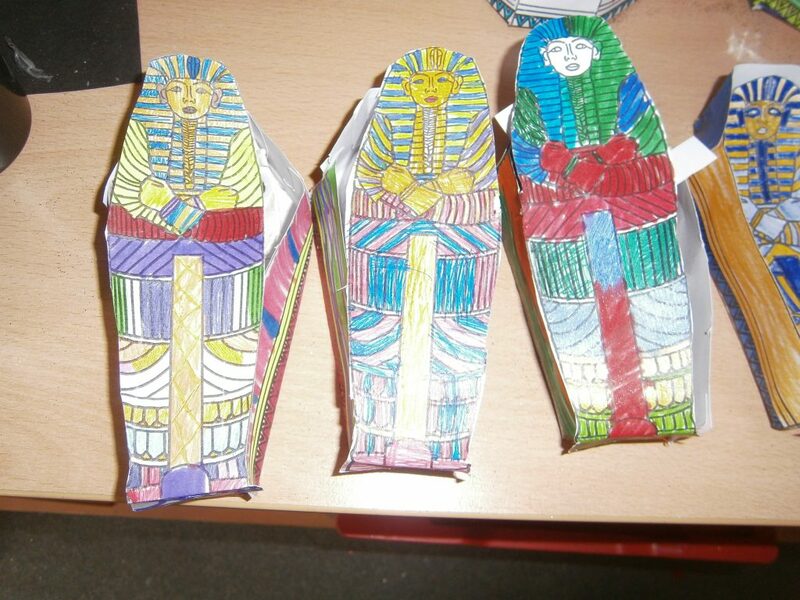 There will be the individual bundle created by your child for you to buy, these are rolled up and ready to go! 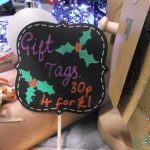 Also there are lots of extras hanging up and on the mug trees for you to peruse and buy too! 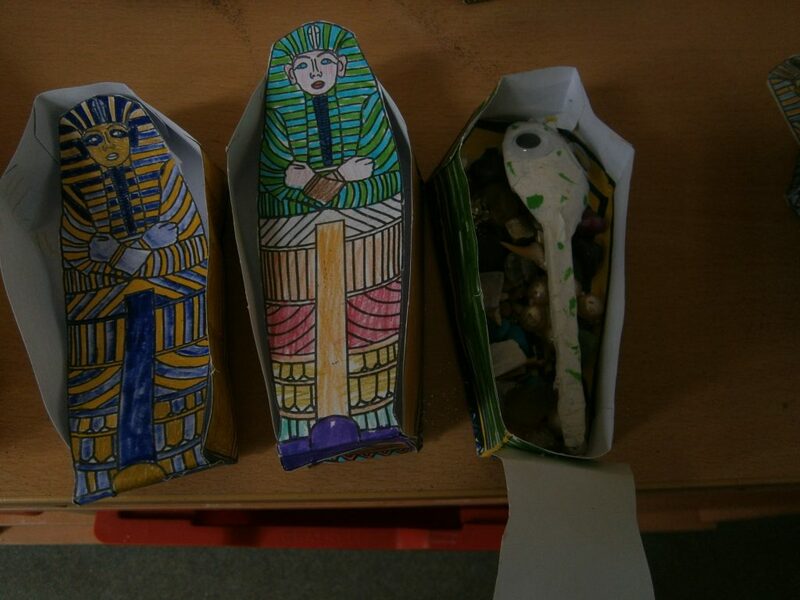 In the meantime we hope you are enjoying our Nativity! 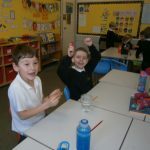 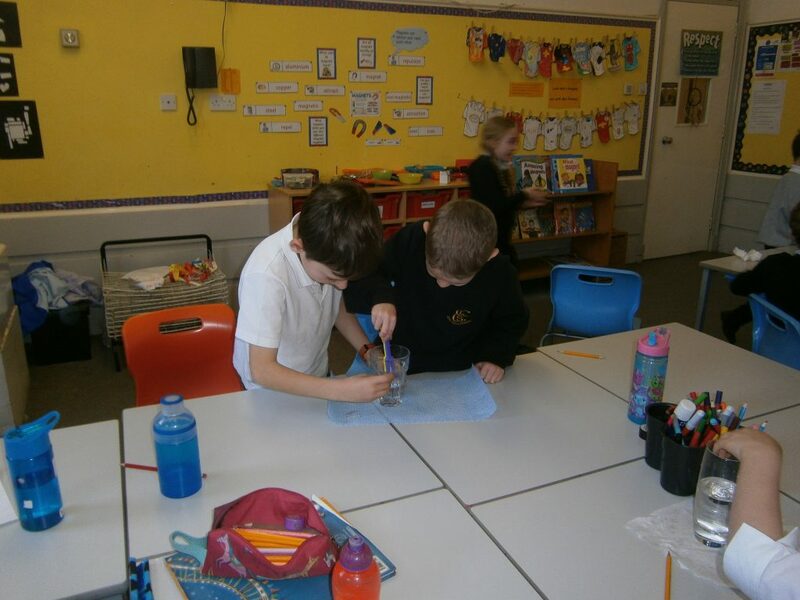 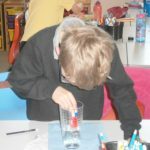 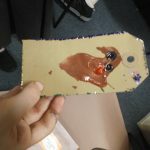 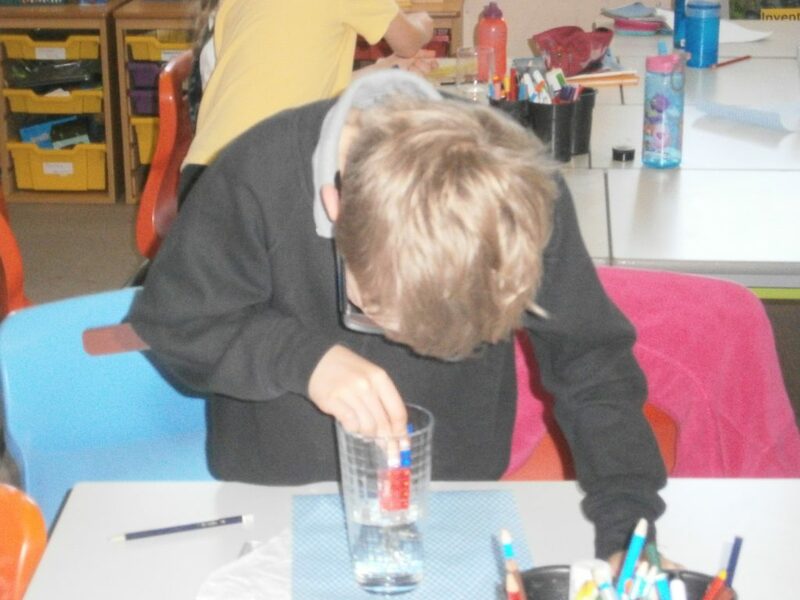 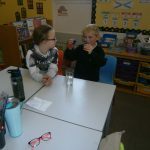 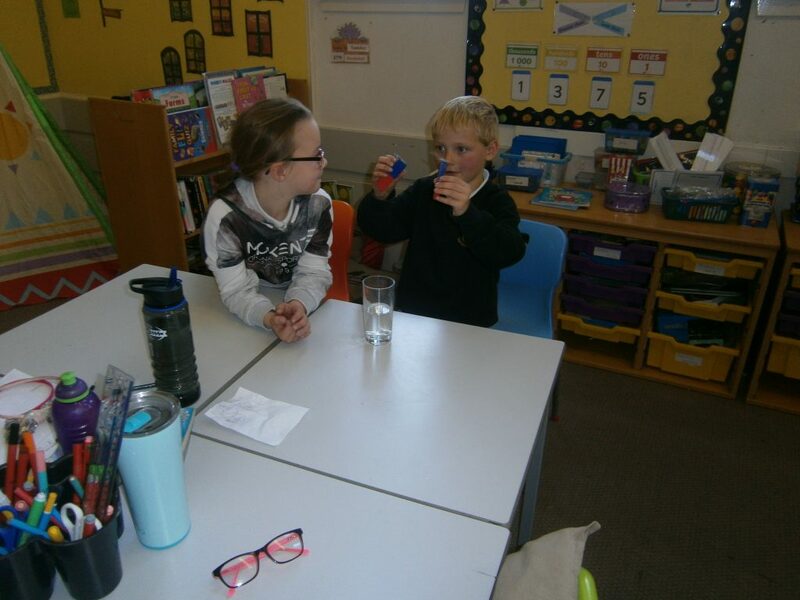 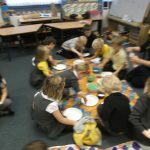 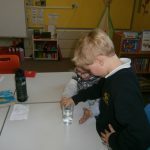 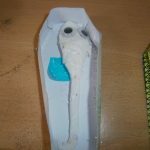 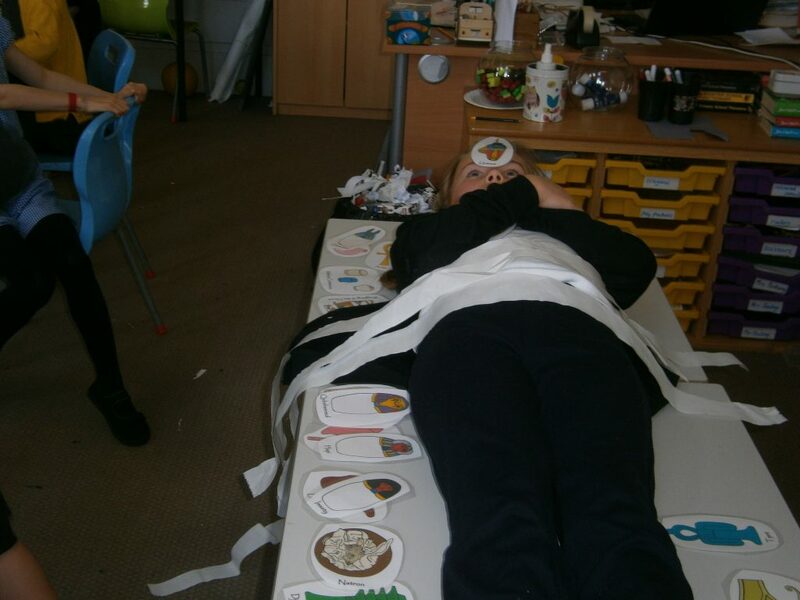 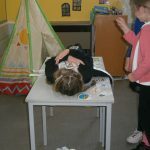 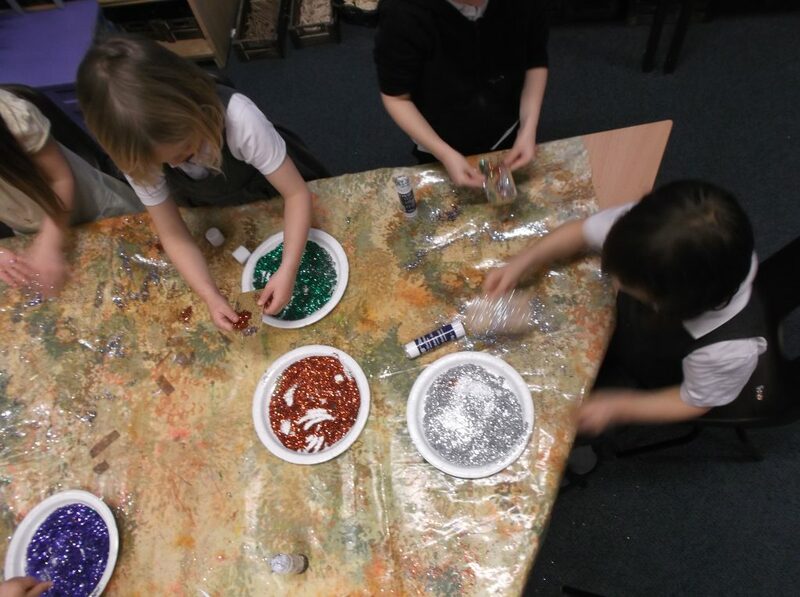 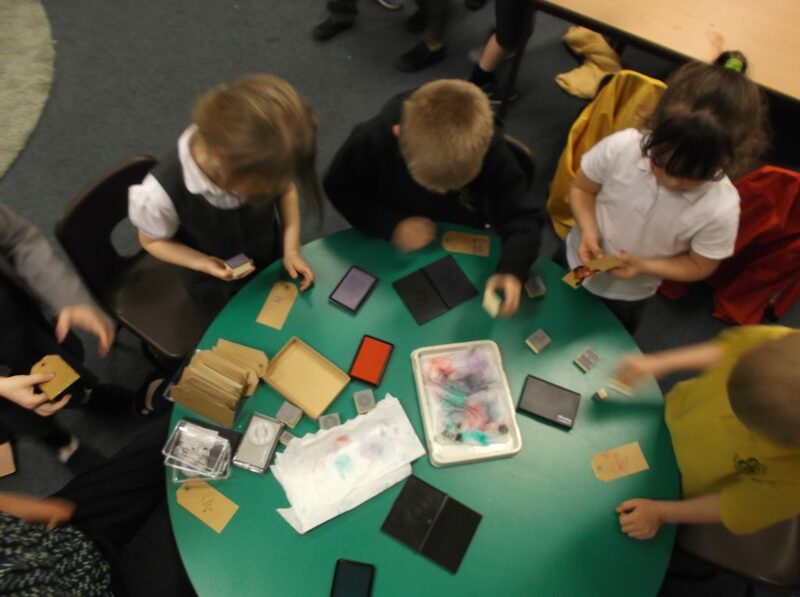 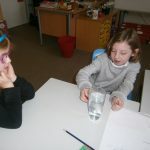 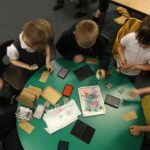 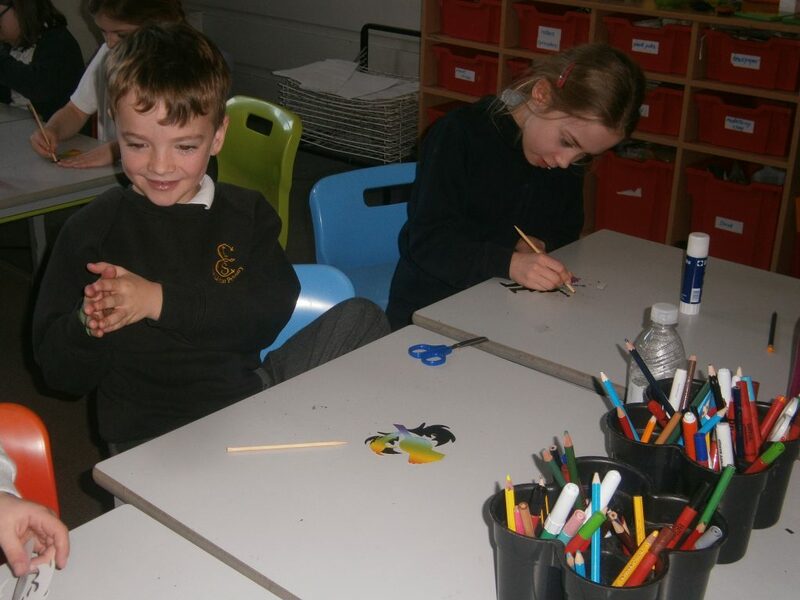 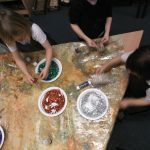 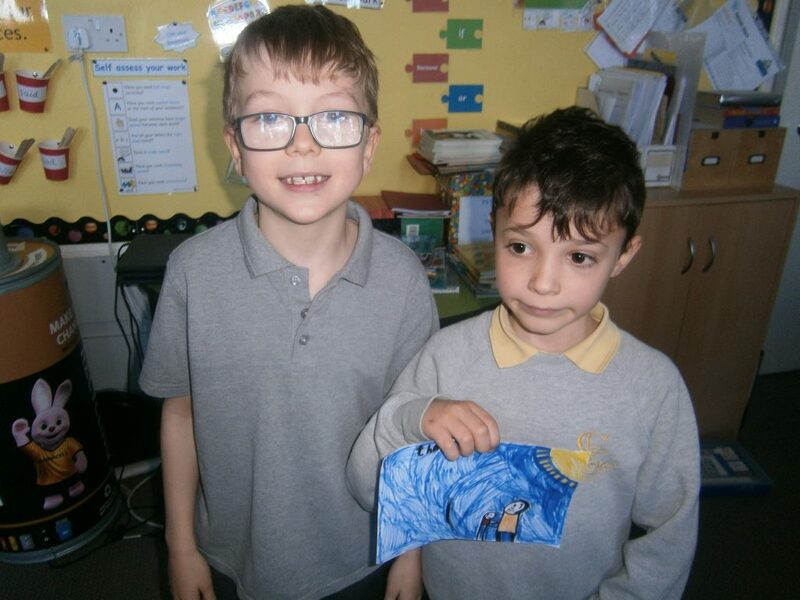 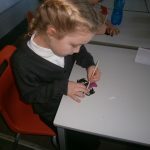 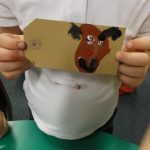 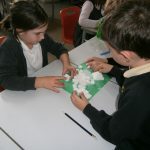 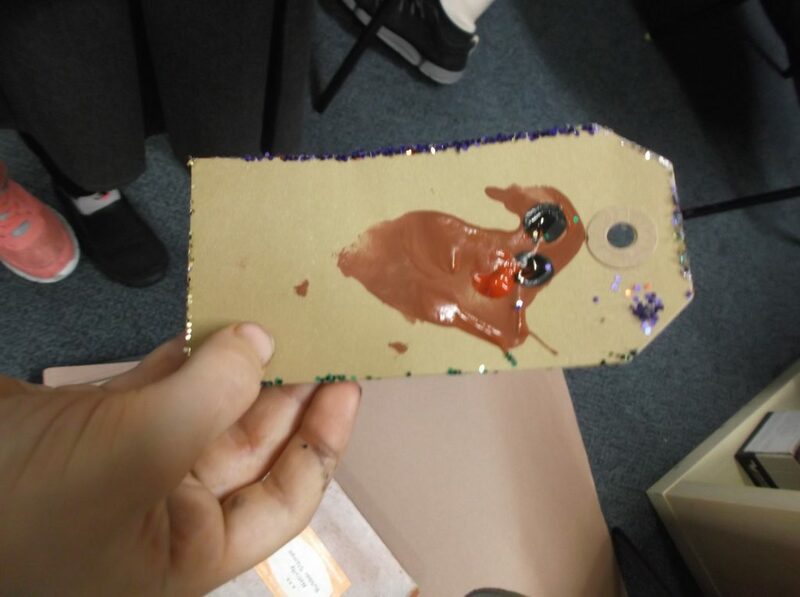 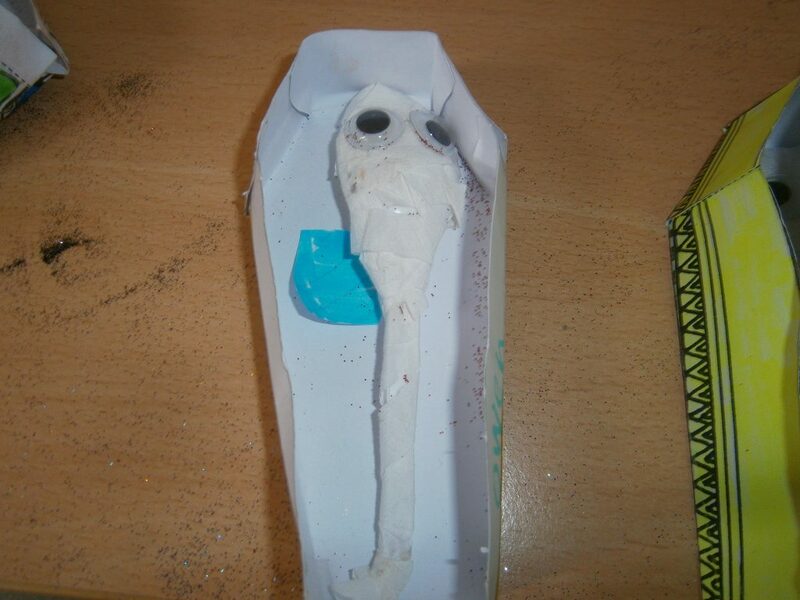 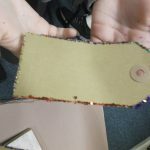 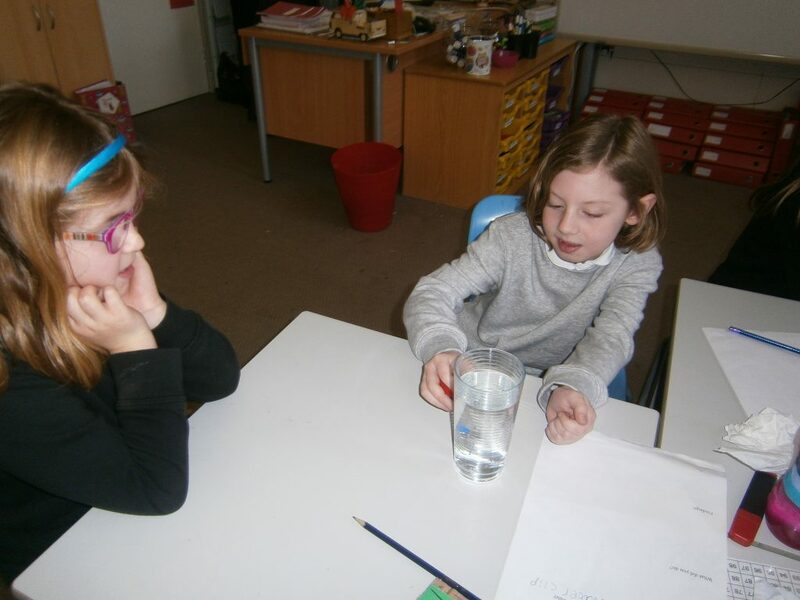 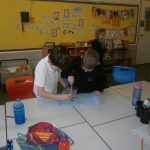 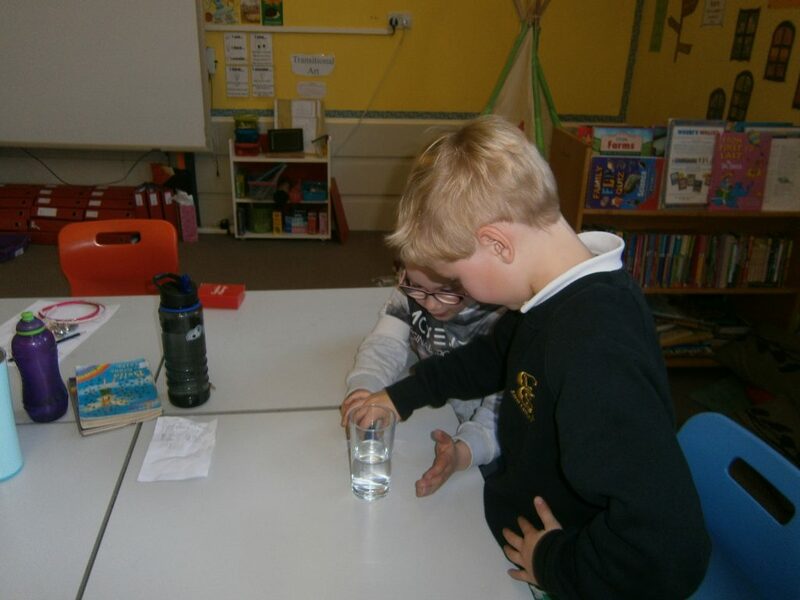 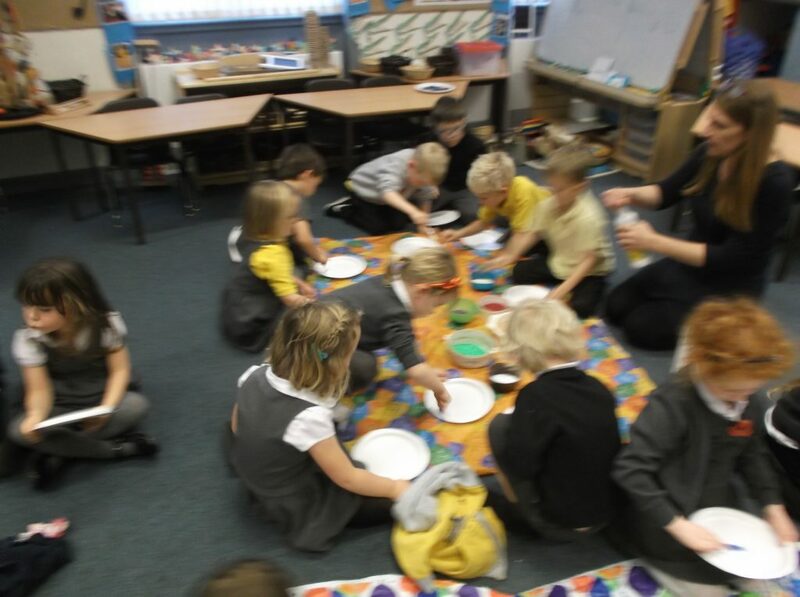 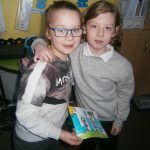 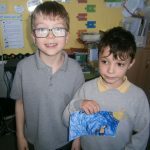 We have been carrying on with our magnet project in P3, this week we carried out some experiments to see if magnets work through non-magnetic materials, we tried plastic, wood, water and glass. 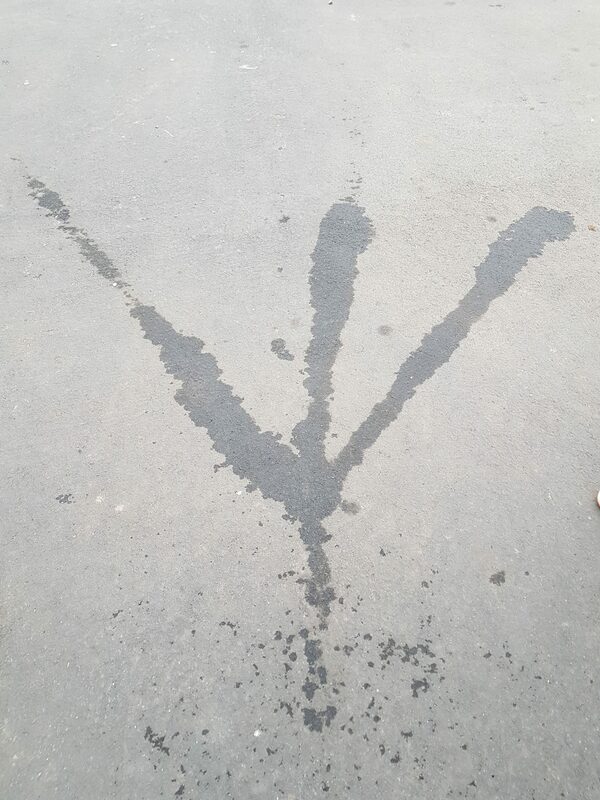 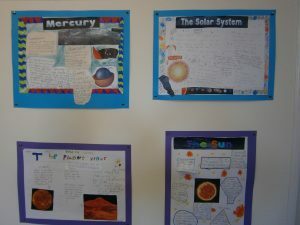 Like all good scientists we wrote up our experiments and our findings. 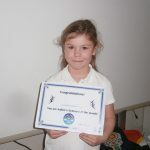 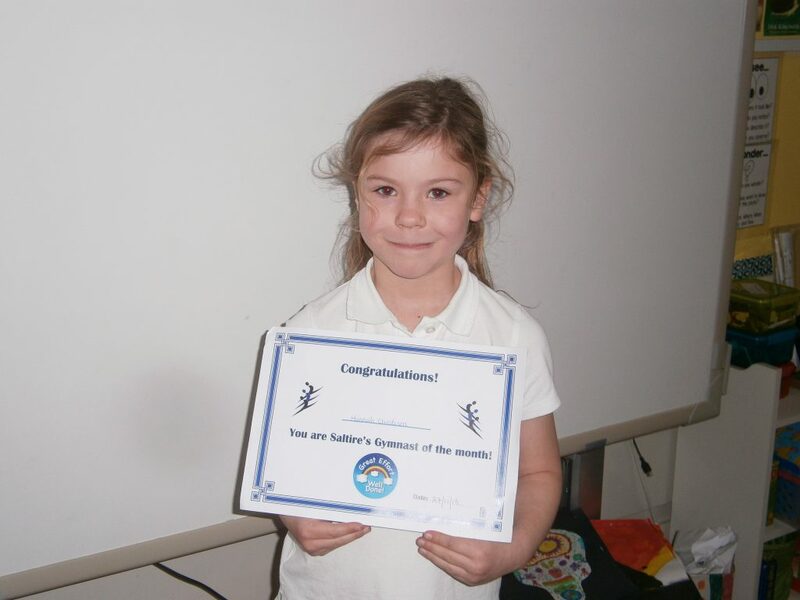 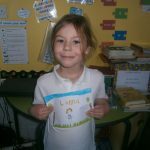 Hannah was presented with a certificate at her gymnastic class this week for being the gymnast of the month, well done, Hannah. 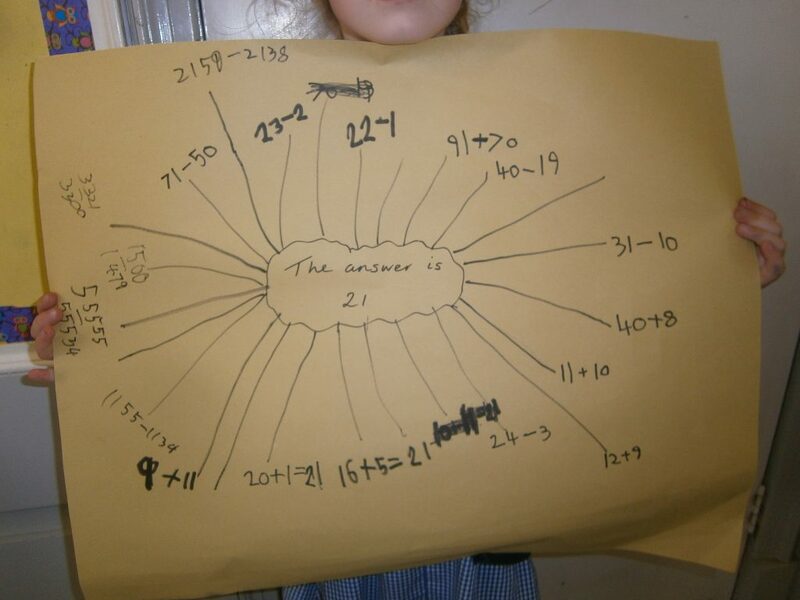 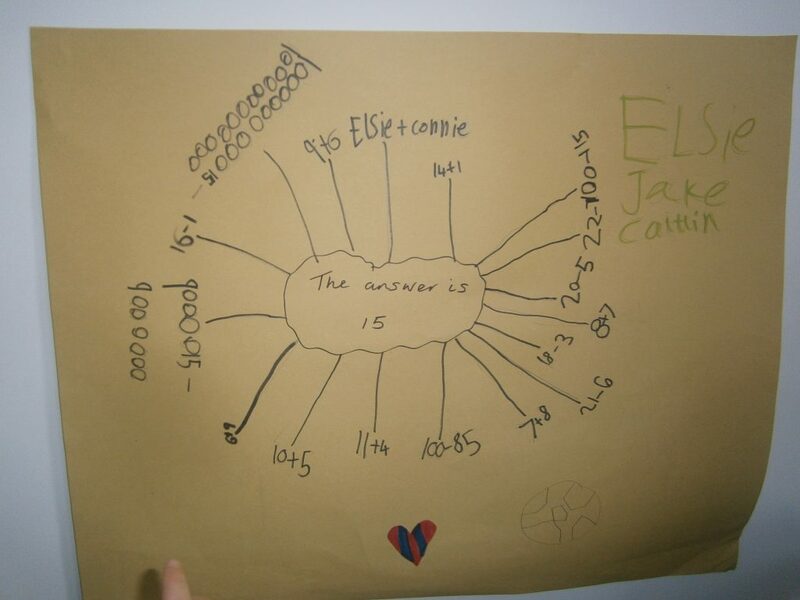 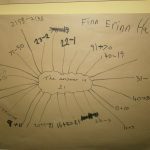 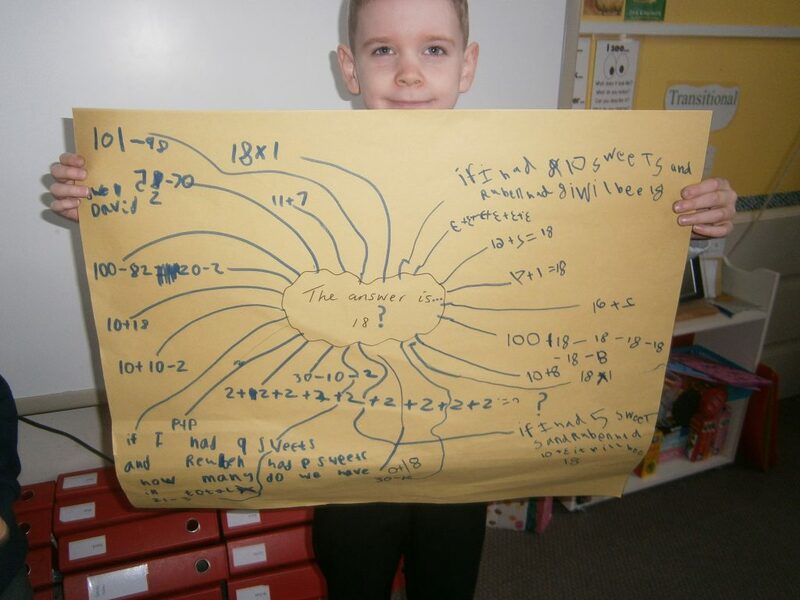 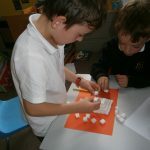 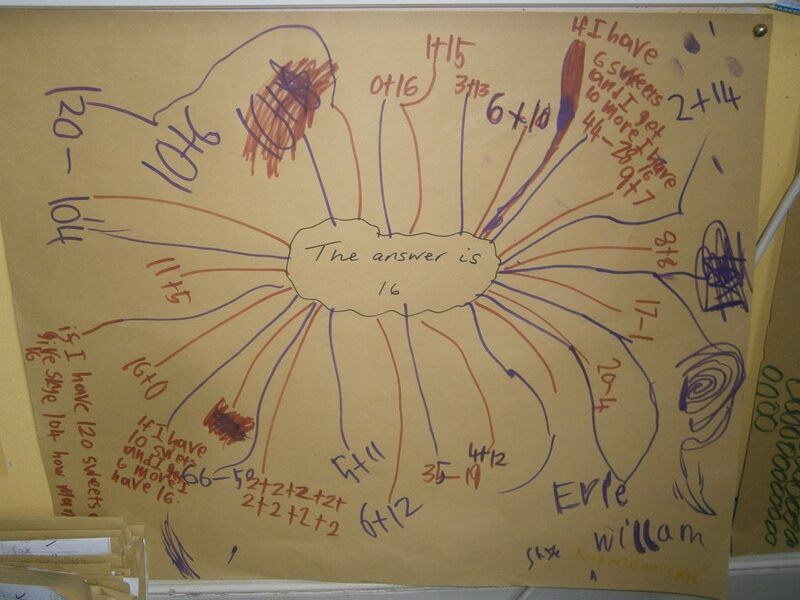 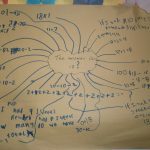 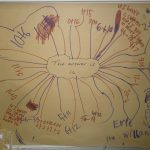 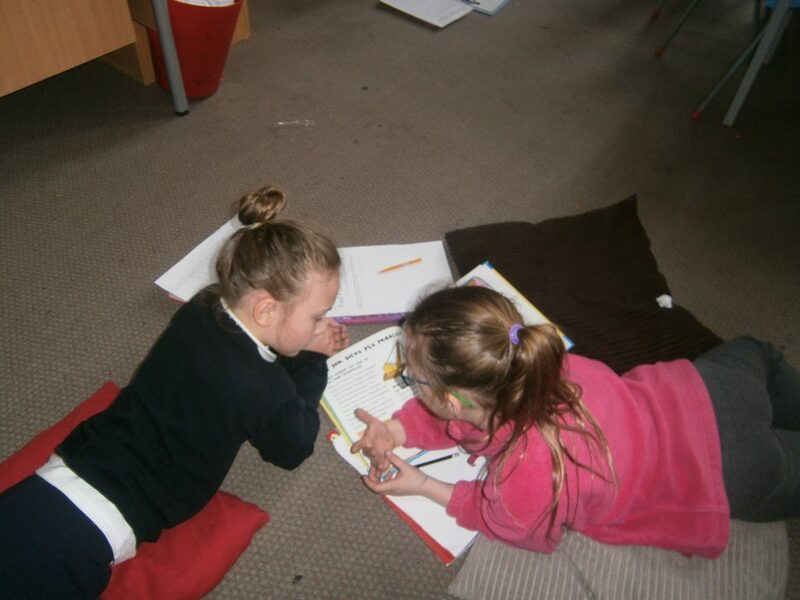 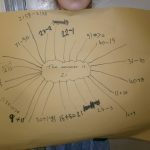 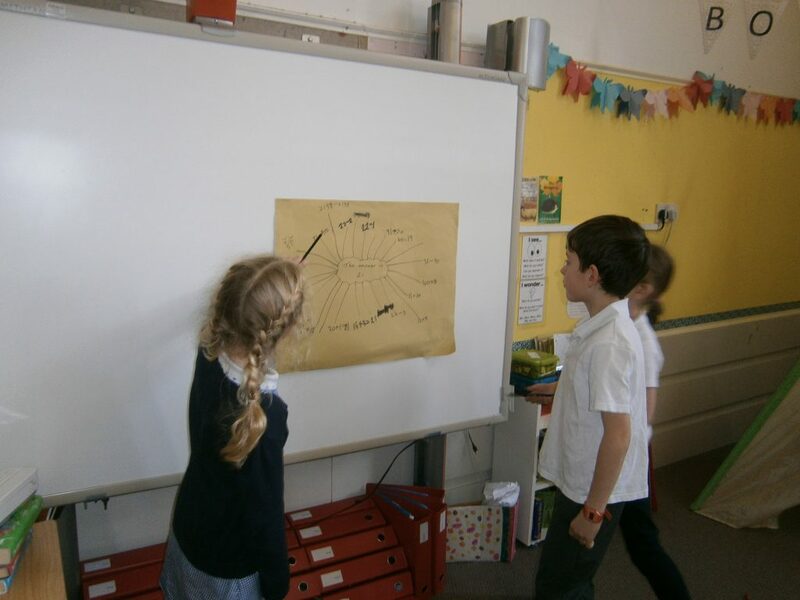 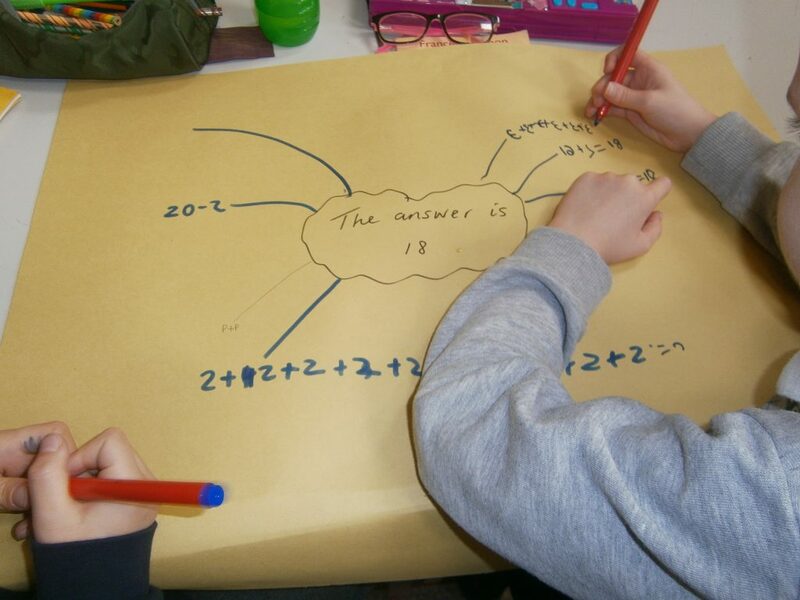 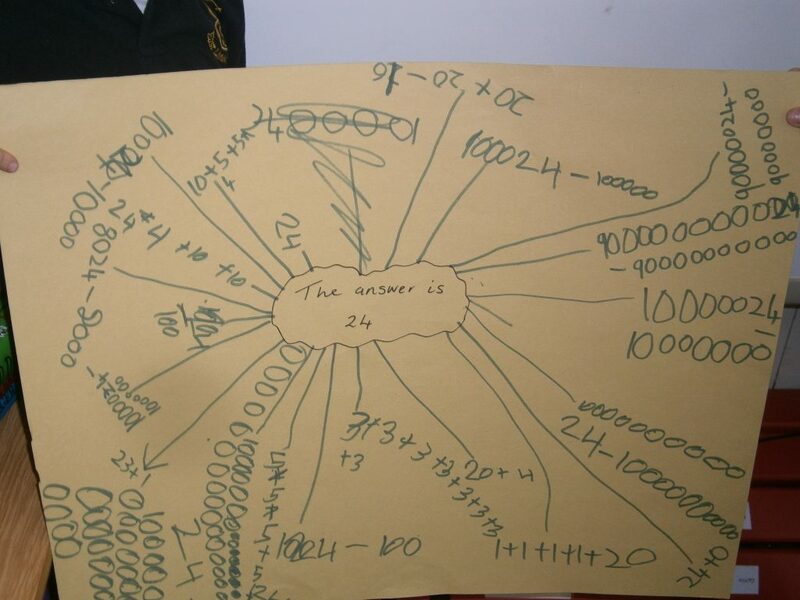 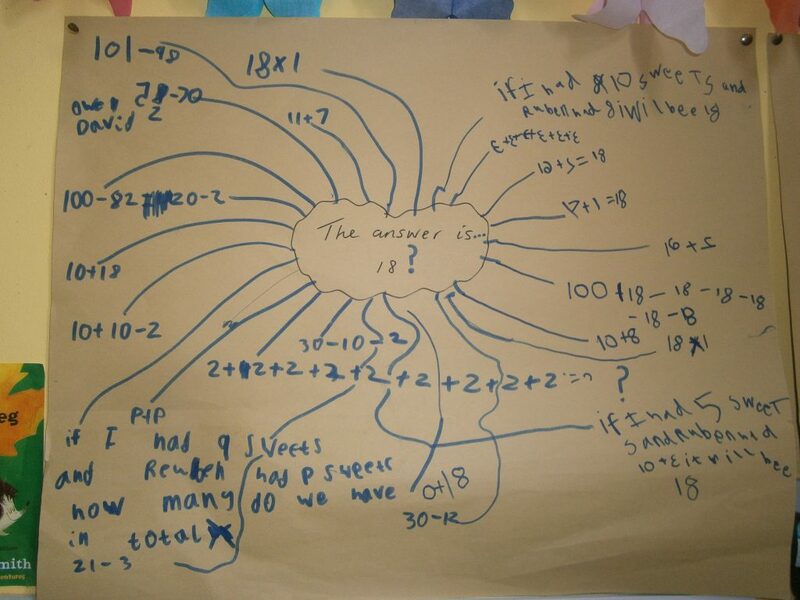 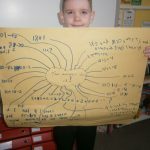 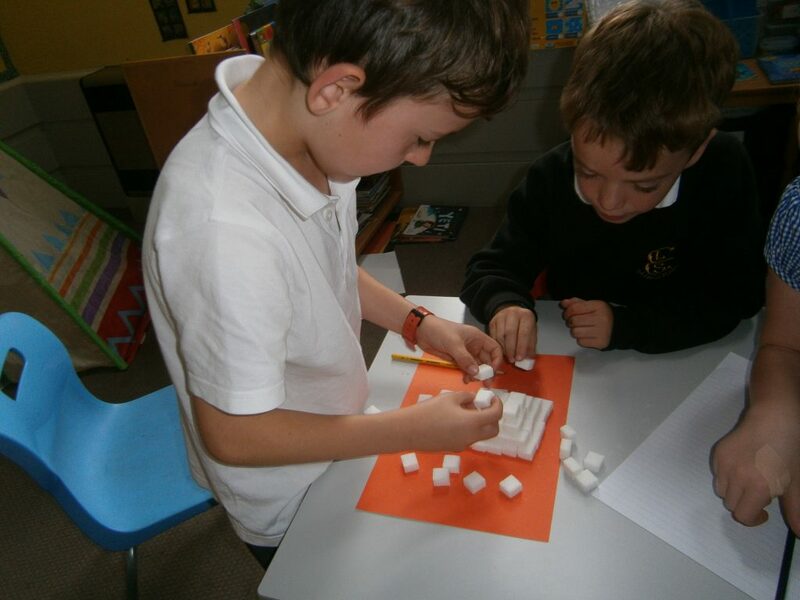 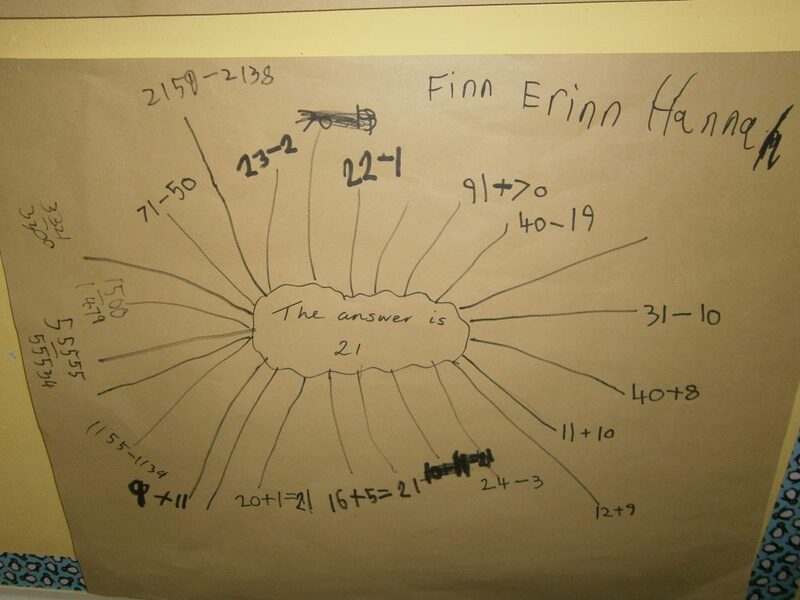 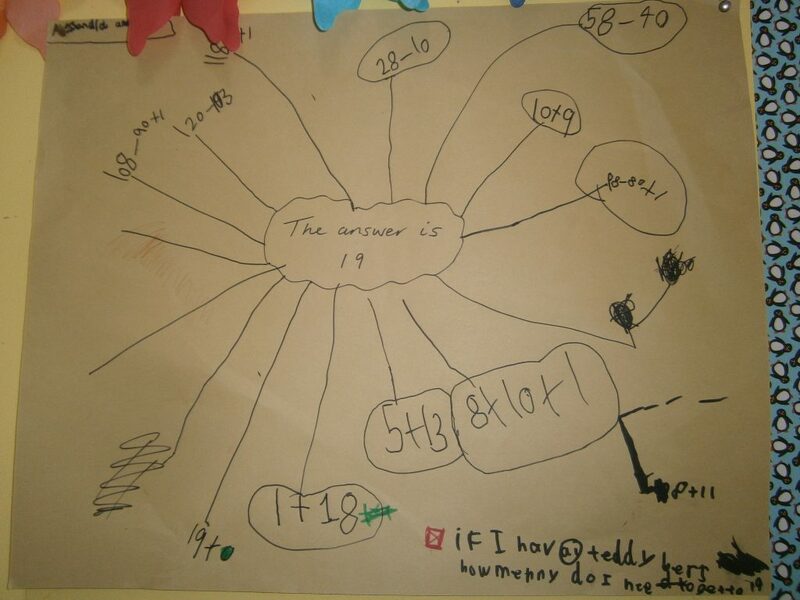 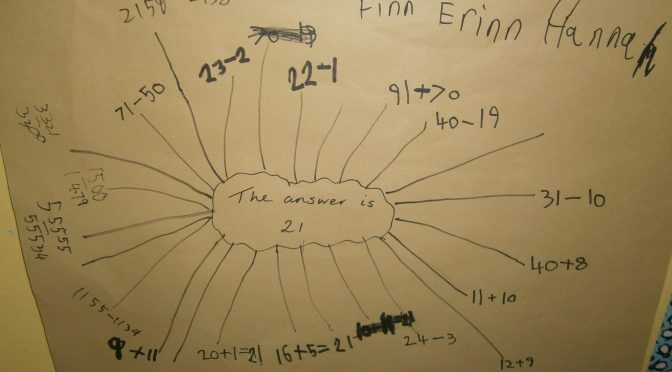 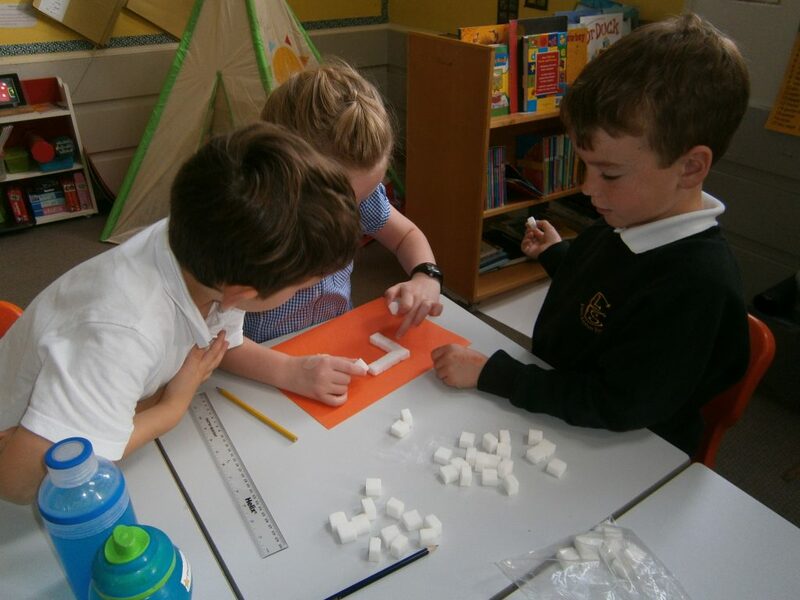 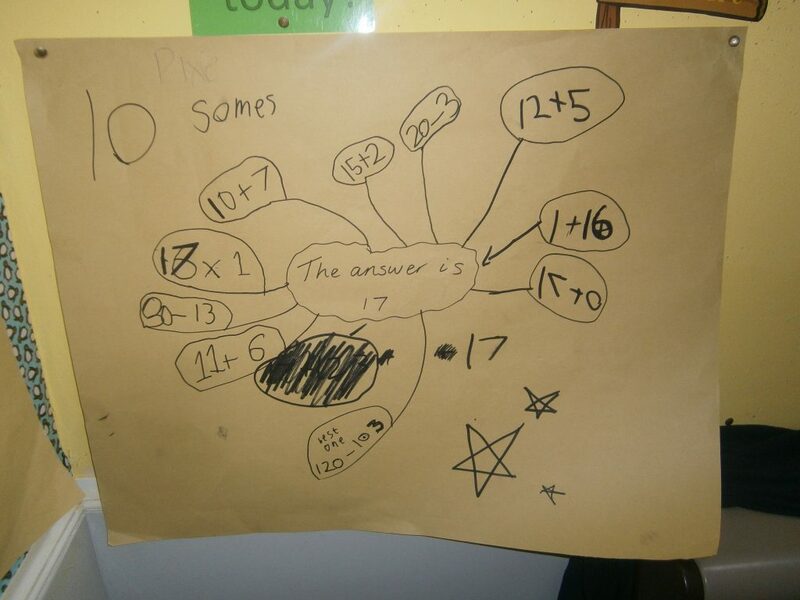 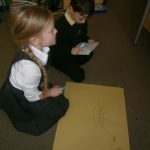 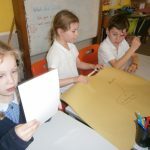 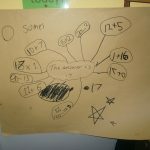 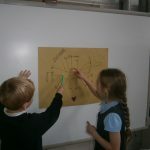 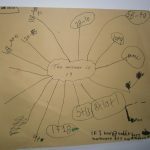 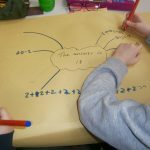 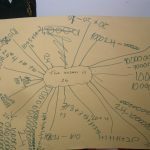 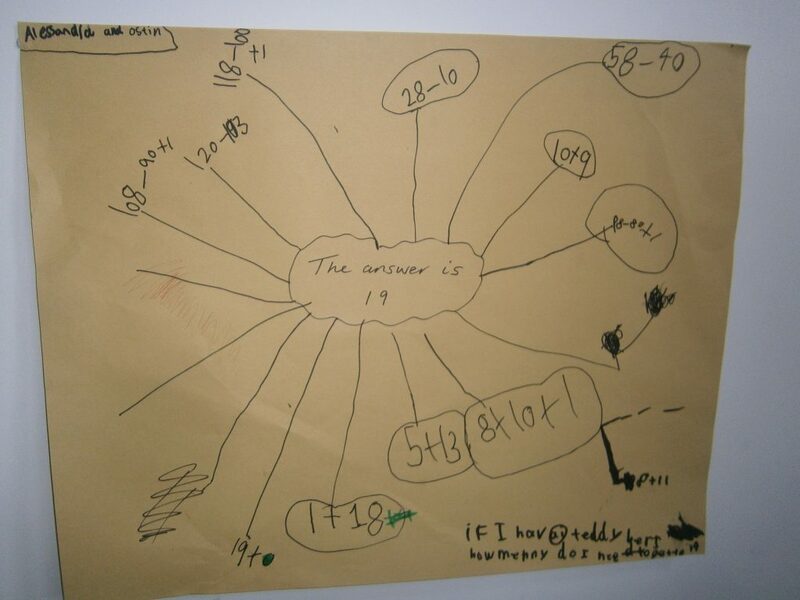 In our numeracy work this week we had the answers we just had to work out what the questions could be. 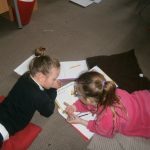 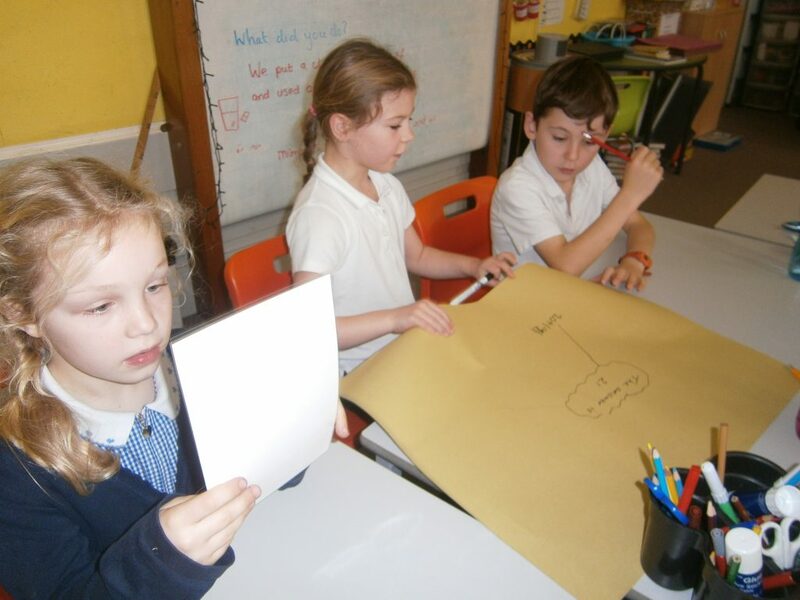 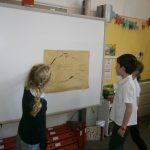 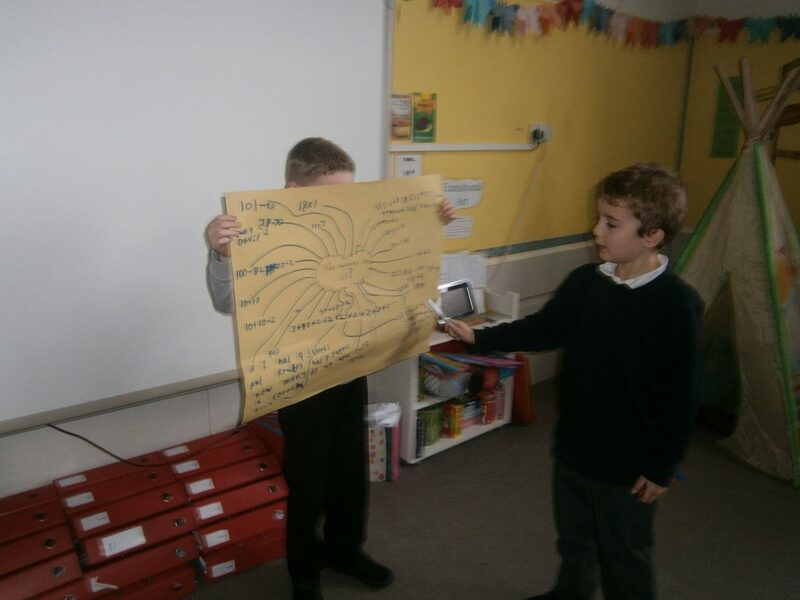 We worked with a partner to try to come up with as many questions as possible and presented our work to the class, some really challenging thinking going on (homework task coming soon). 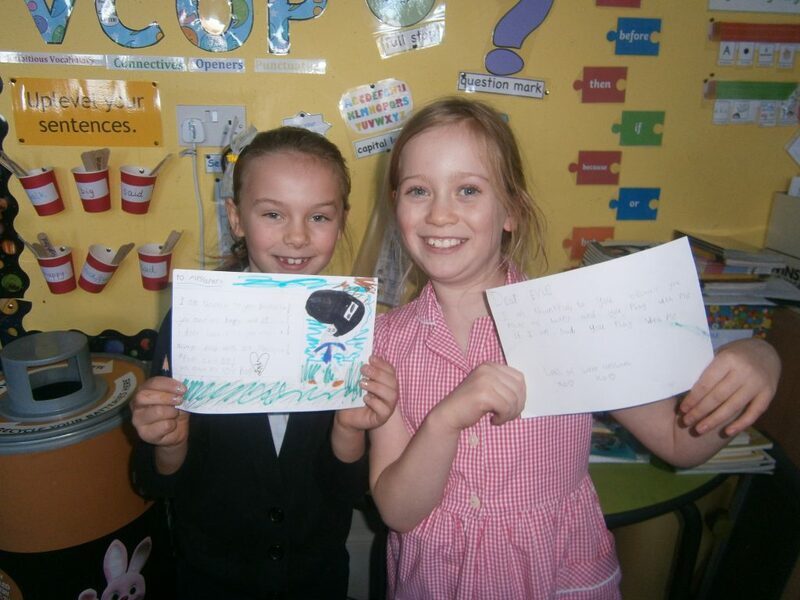 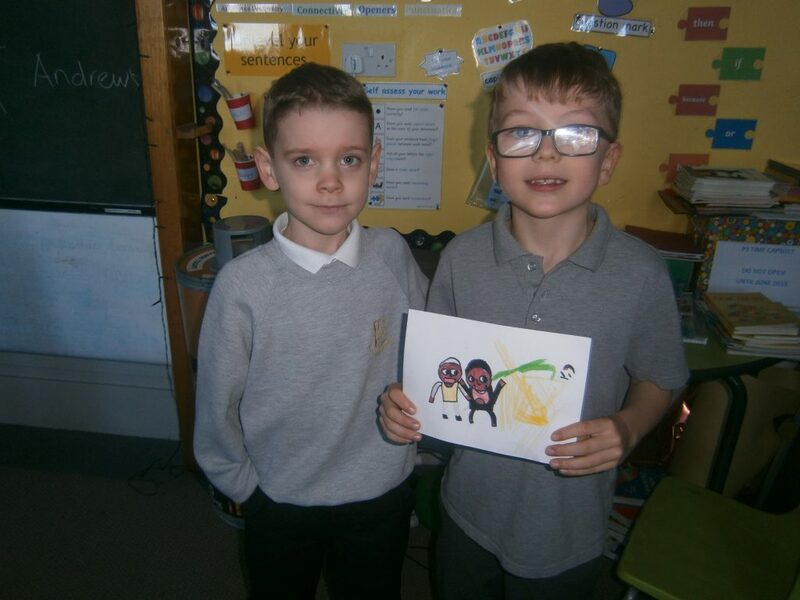 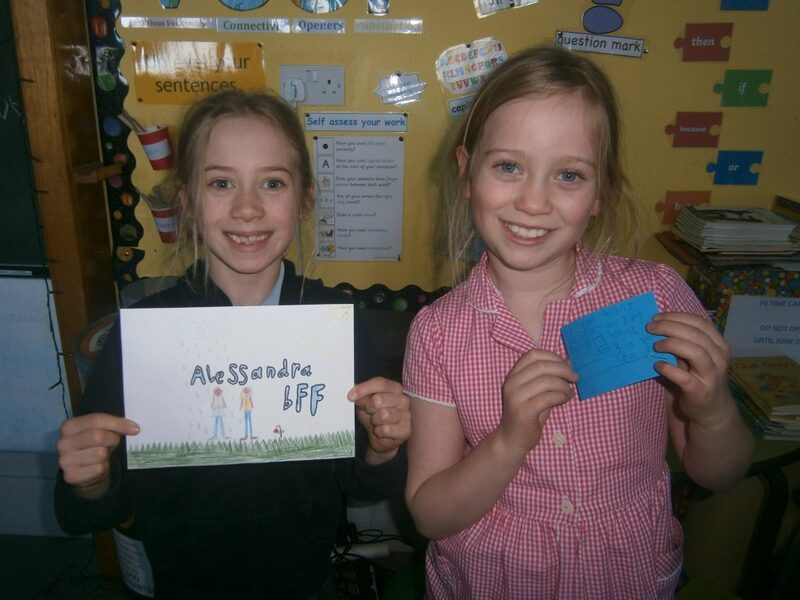 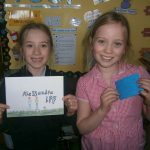 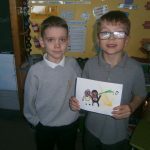 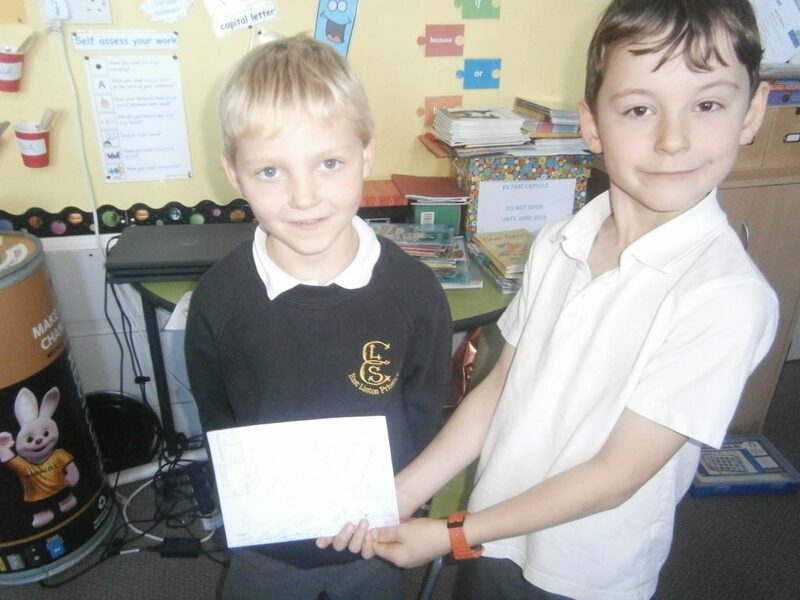 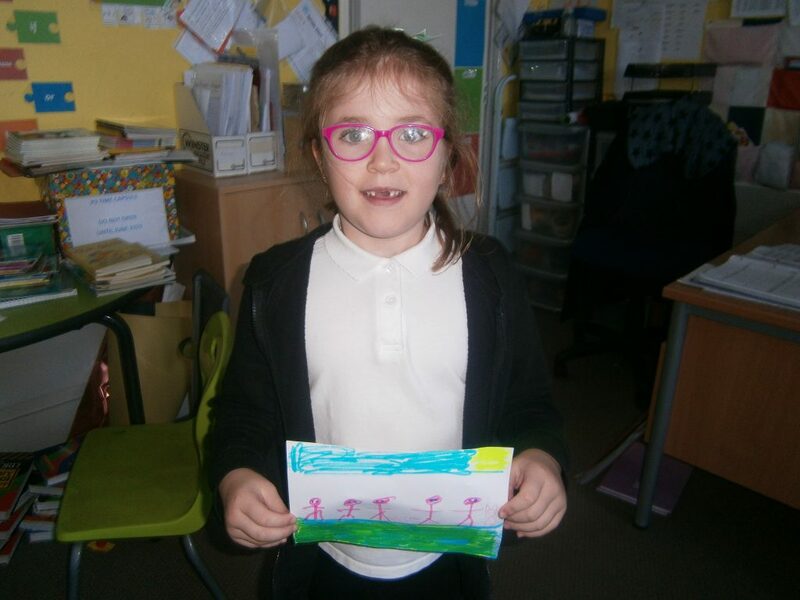 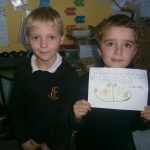 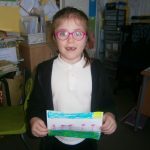 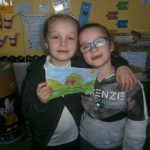 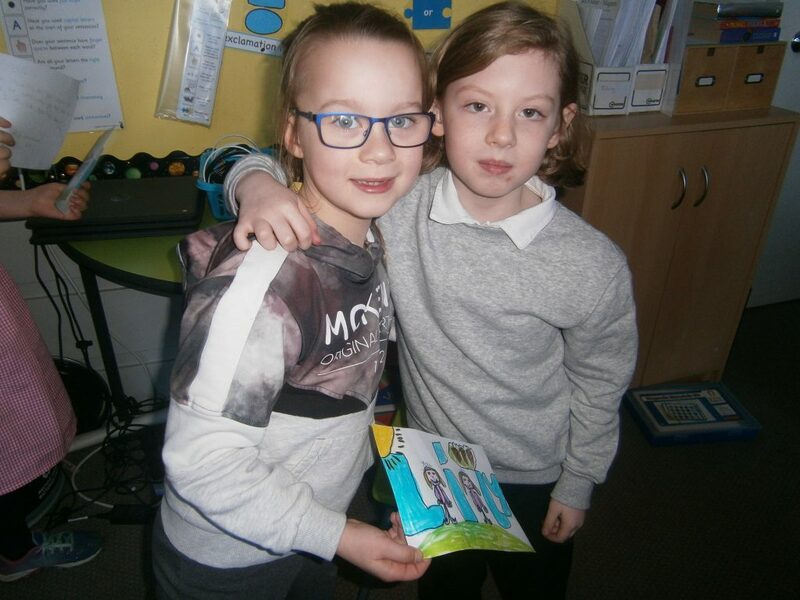 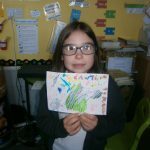 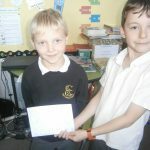 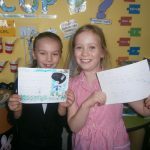 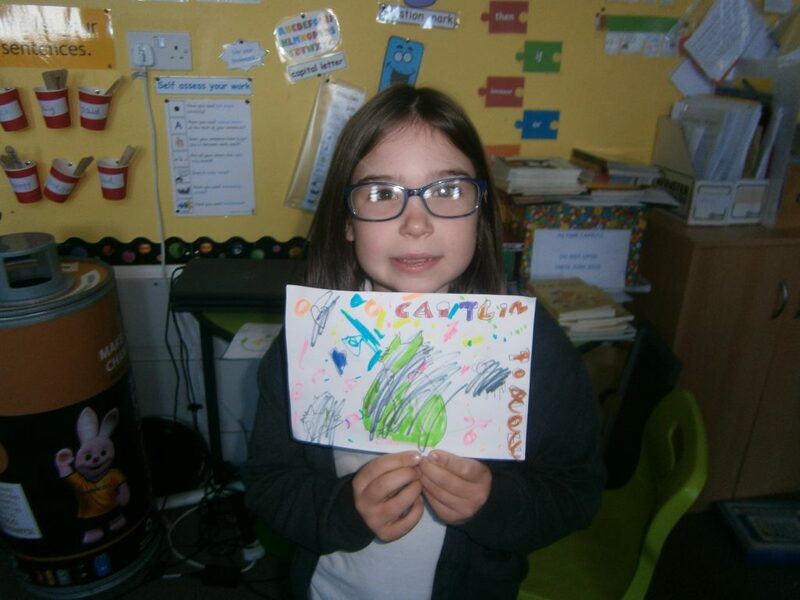 In our writing this week we were thinking and talking about what we are grateful for, we wrote postcards to the people we are grateful to and presented them in class. 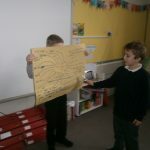 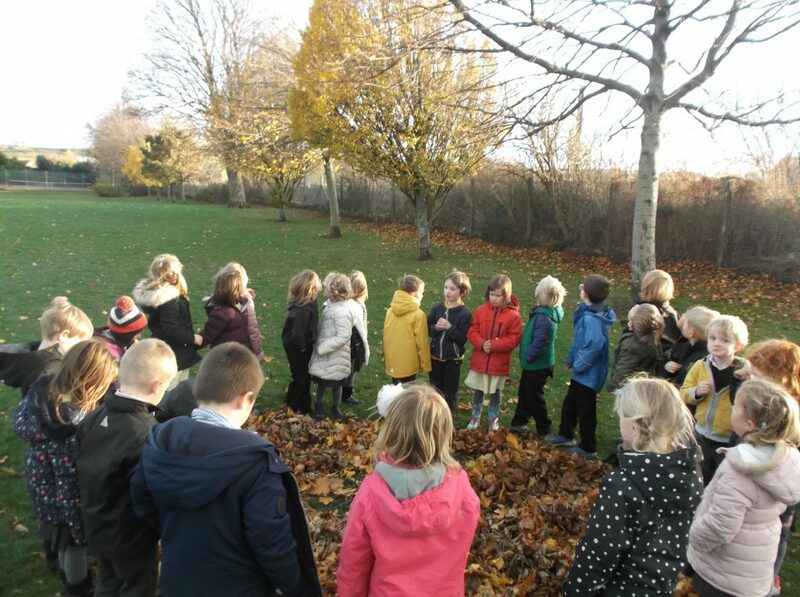 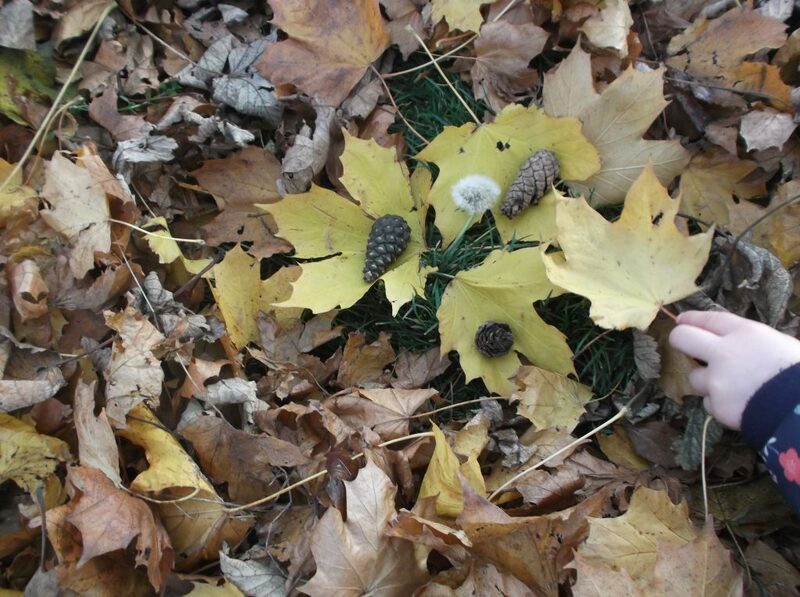 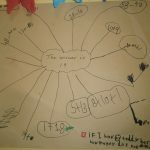 There were some lovely thoughts about friends who help us when we are stuck or when we are hurt and how grateful we are to our families who love us and take care of us. 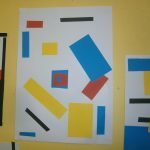 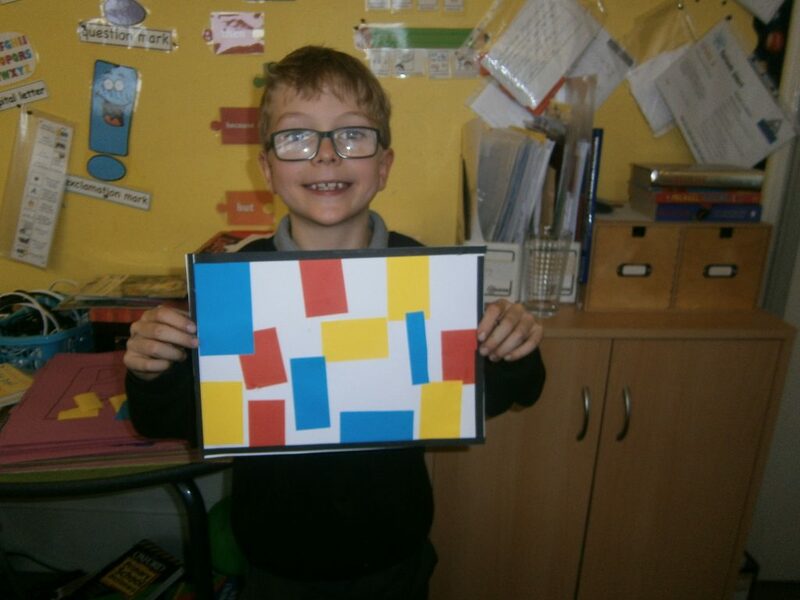 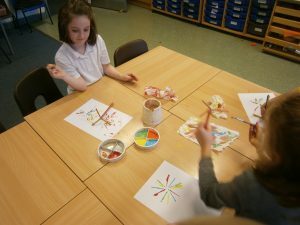 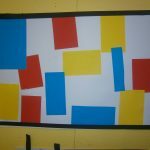 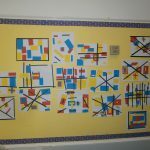 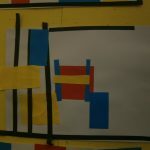 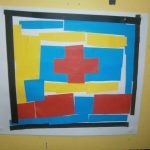 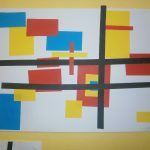 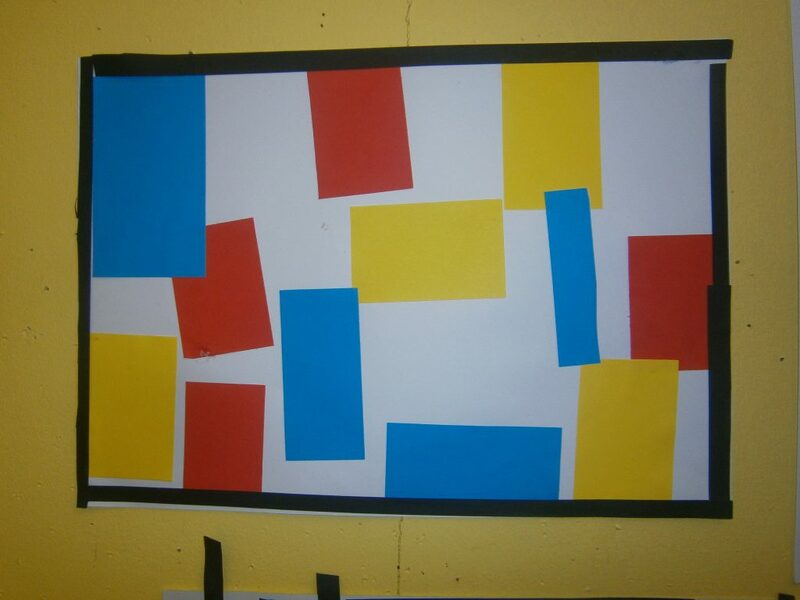 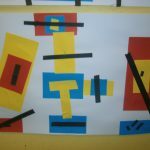 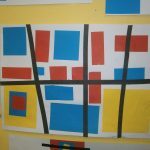 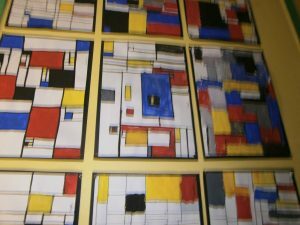 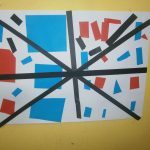 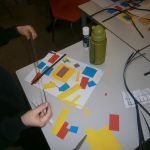 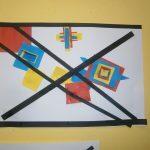 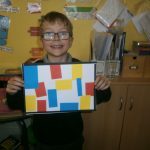 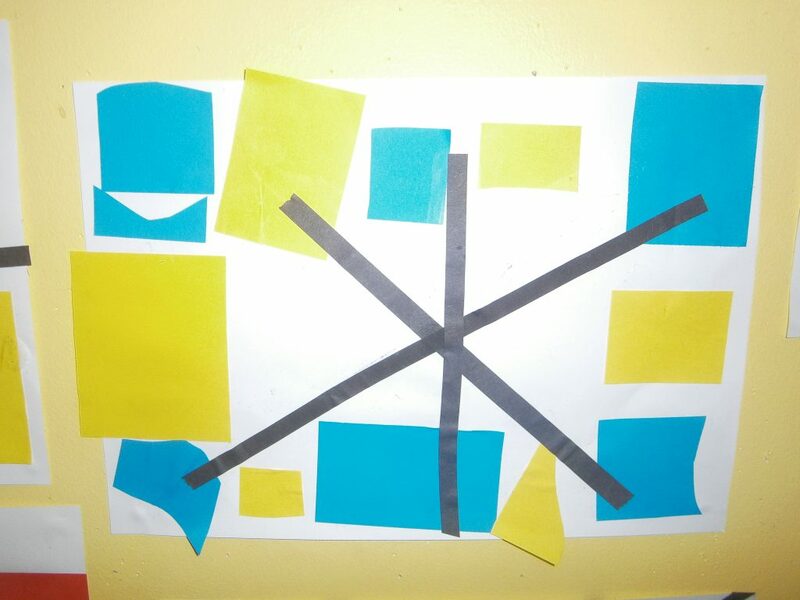 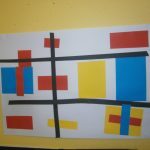 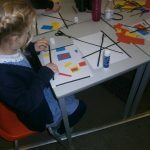 We have been looking at colour in our art lessons and this week we focused on primary colours, we looked at the work of Piet Mondrian and spent time creating a collage inspired by his work. 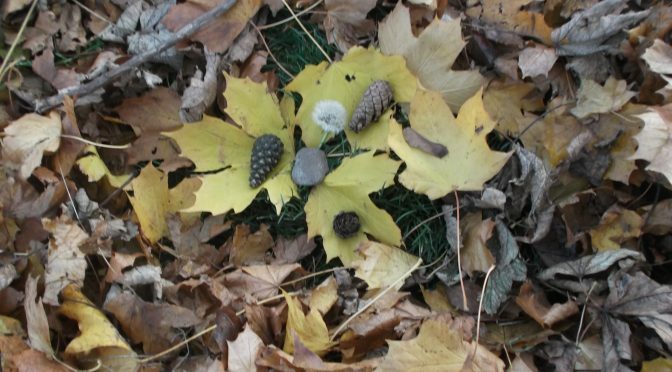 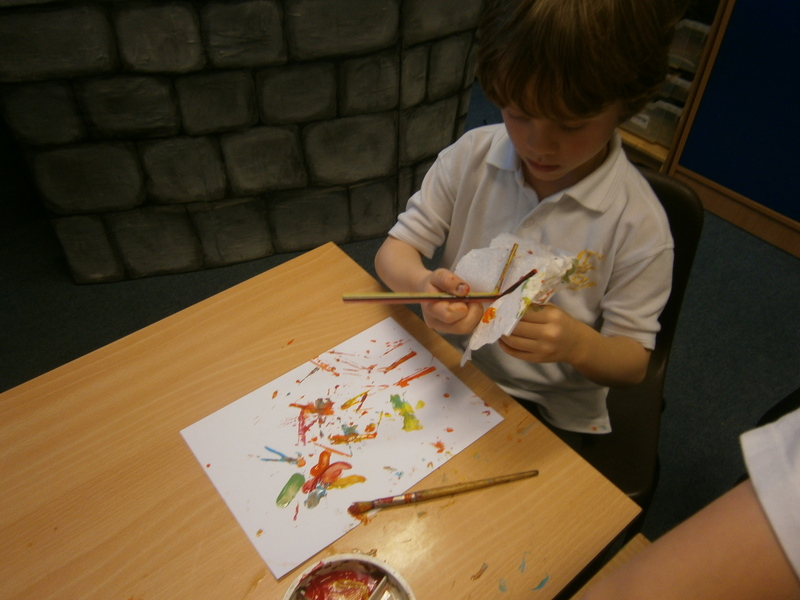 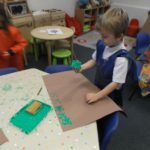 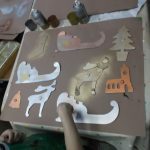 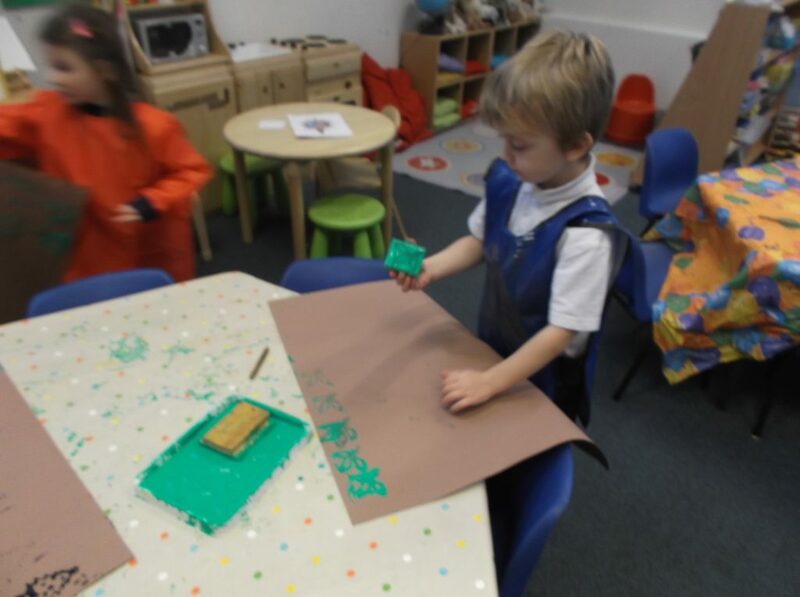 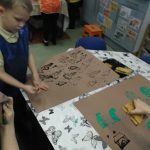 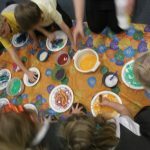 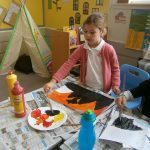 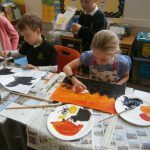 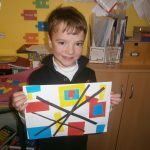 We took our time to move shapes and colours around to see what worked best for composition and then we glued the pieces in place. 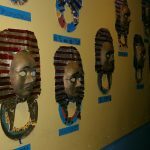 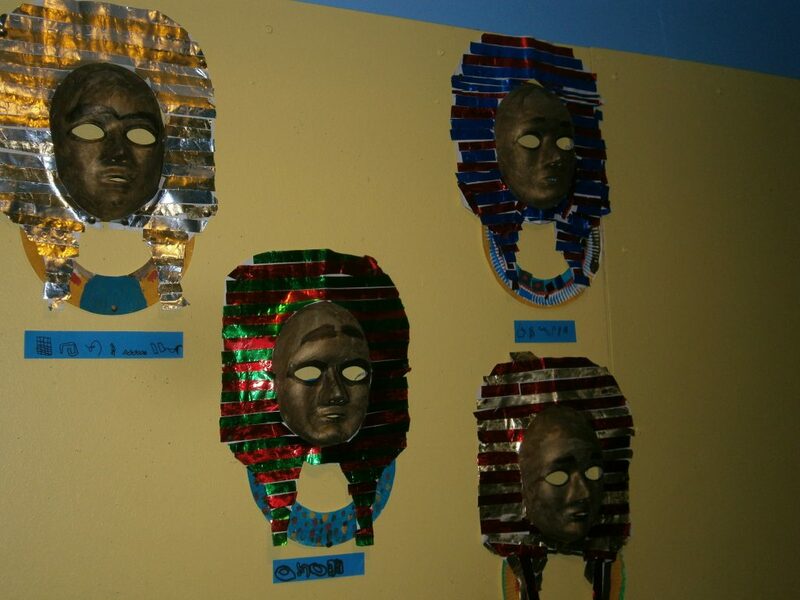 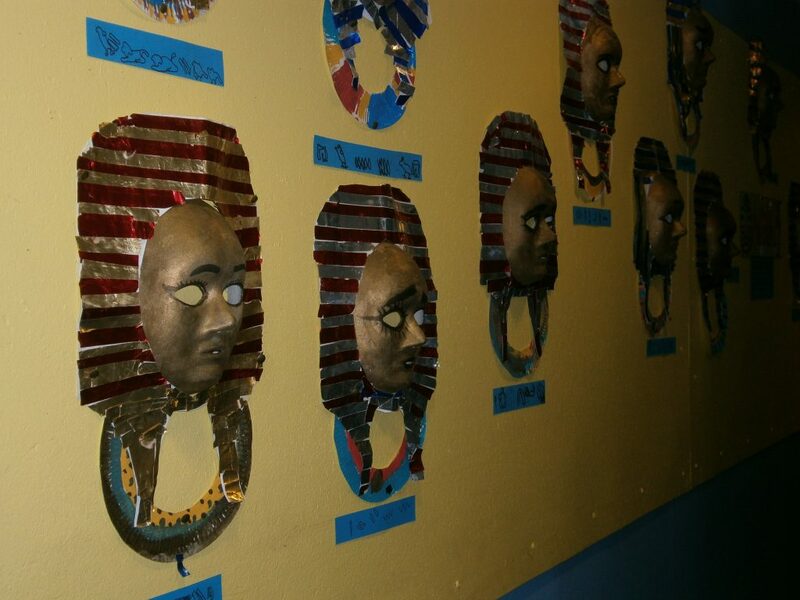 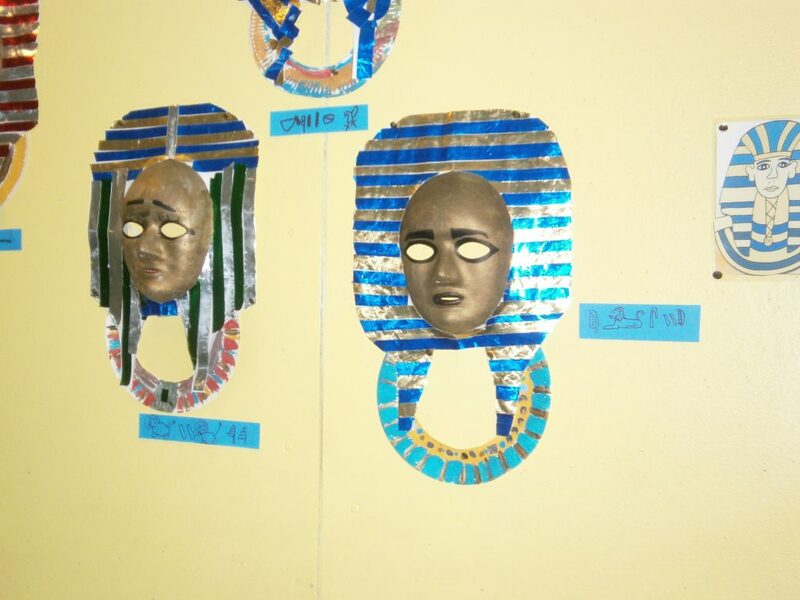 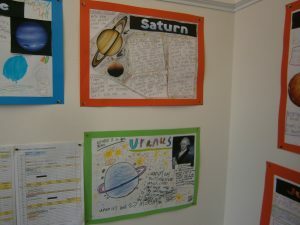 They look fantastic on the classroom wall. 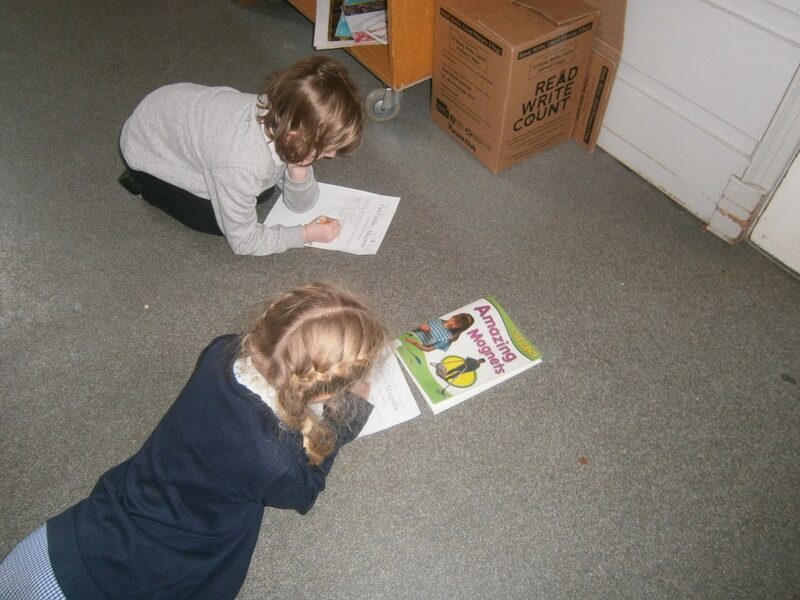 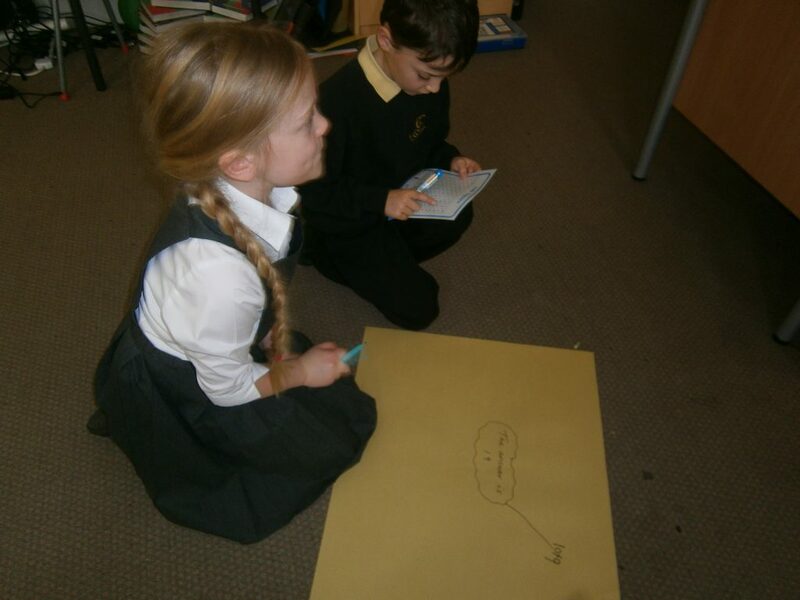 We have also been doing some independent research on our magnet project using non-fiction books to find out some further information and to help us understand the key vocabulary. 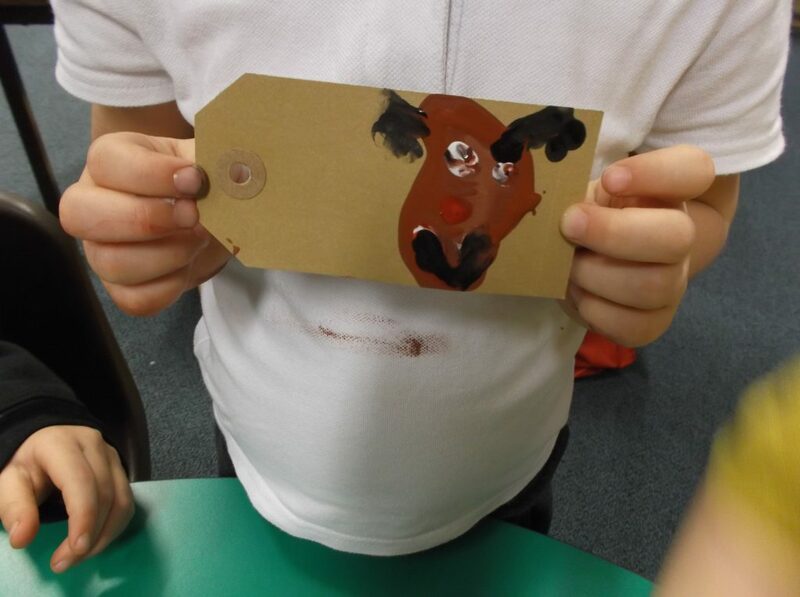 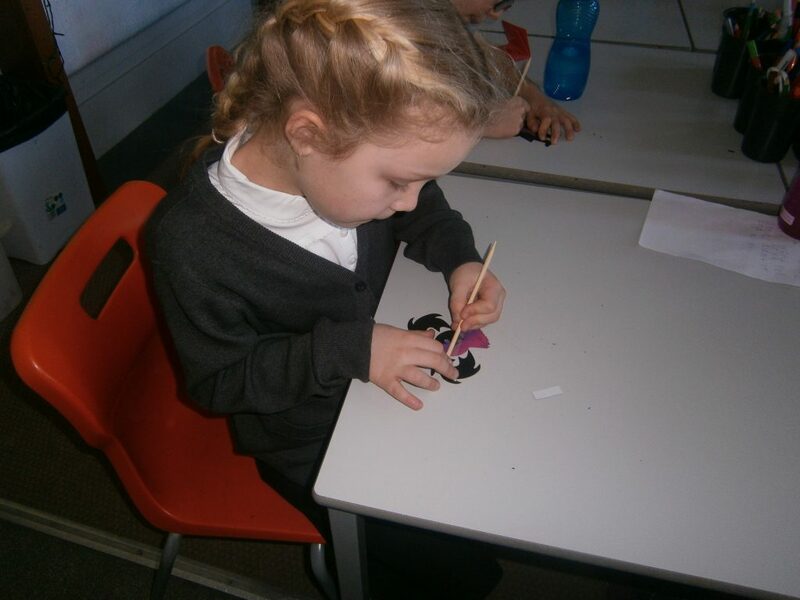 Finally as it was St Andrew’s Day on Friday we made some Scottish themed magnets to take home. 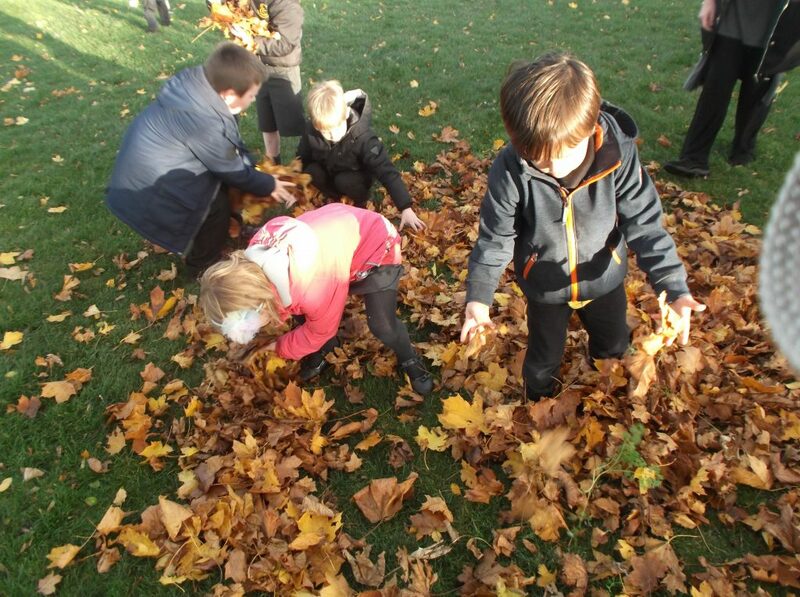 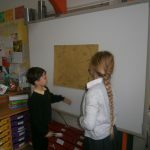 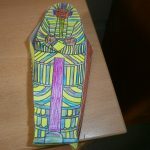 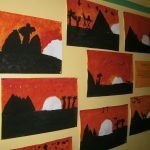 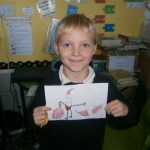 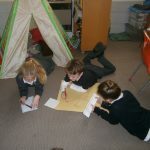 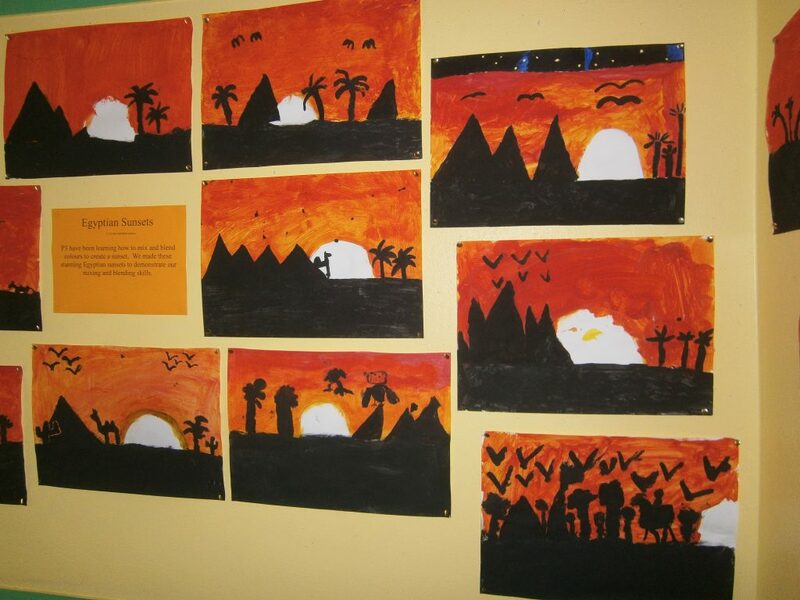 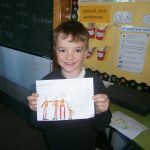 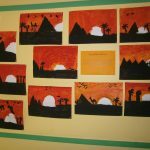 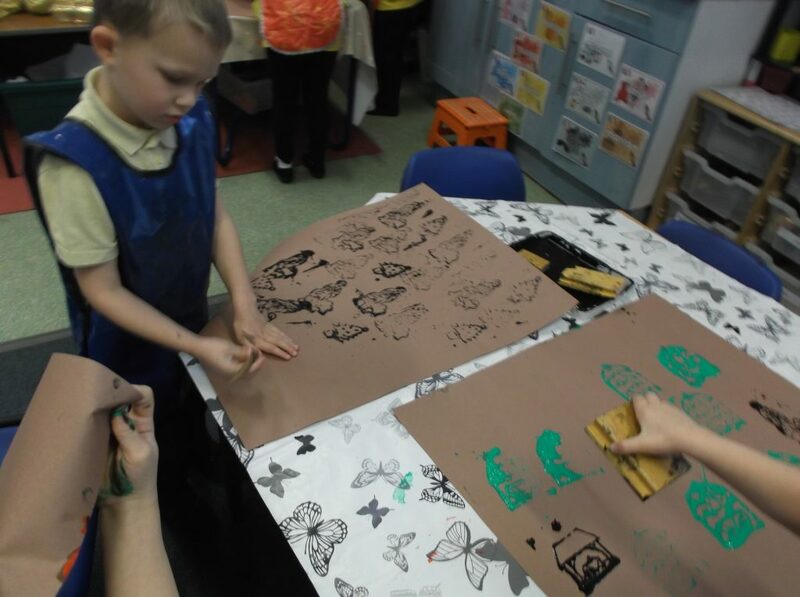 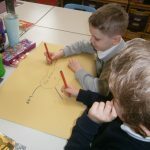 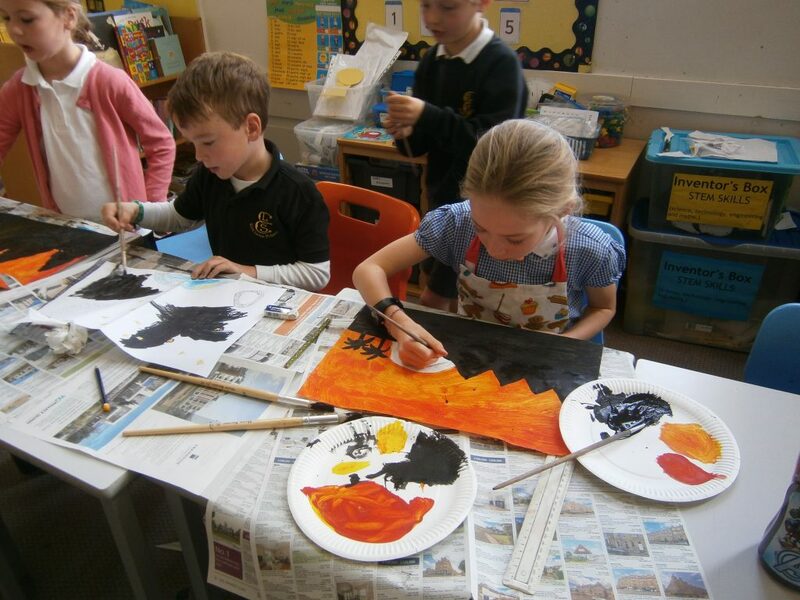 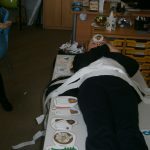 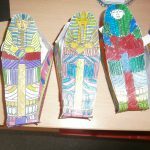 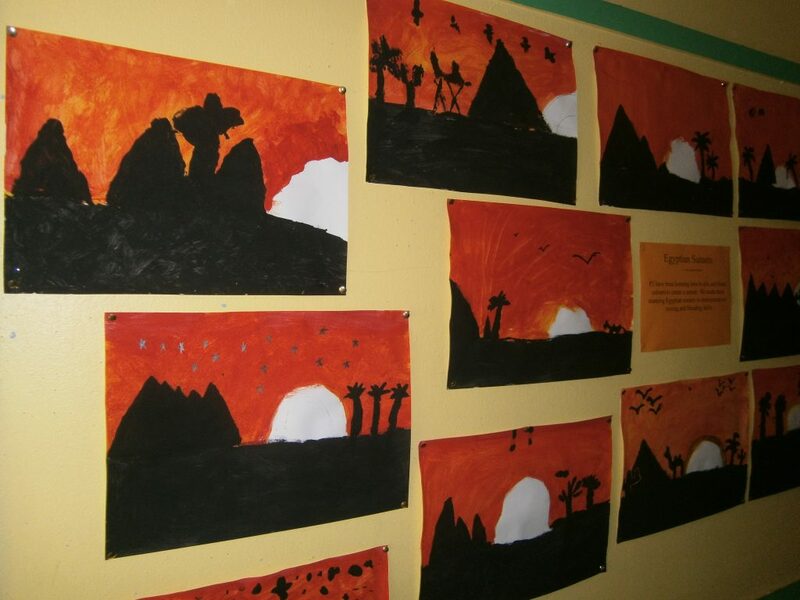 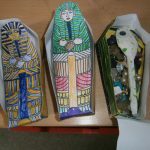 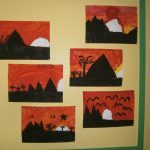 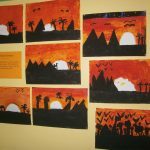 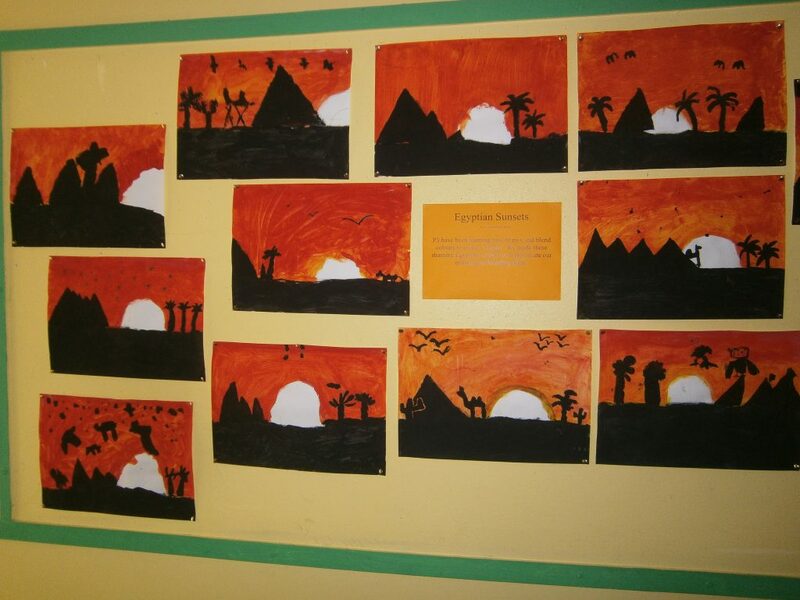 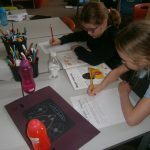 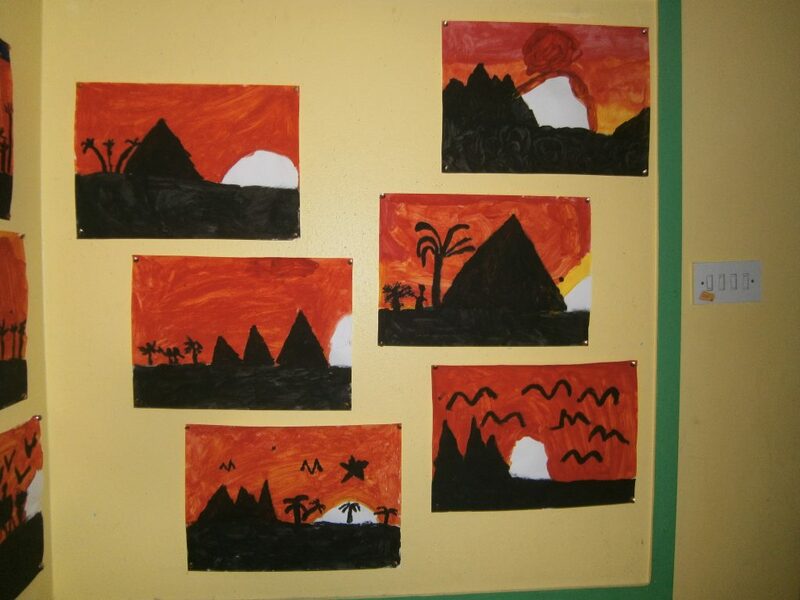 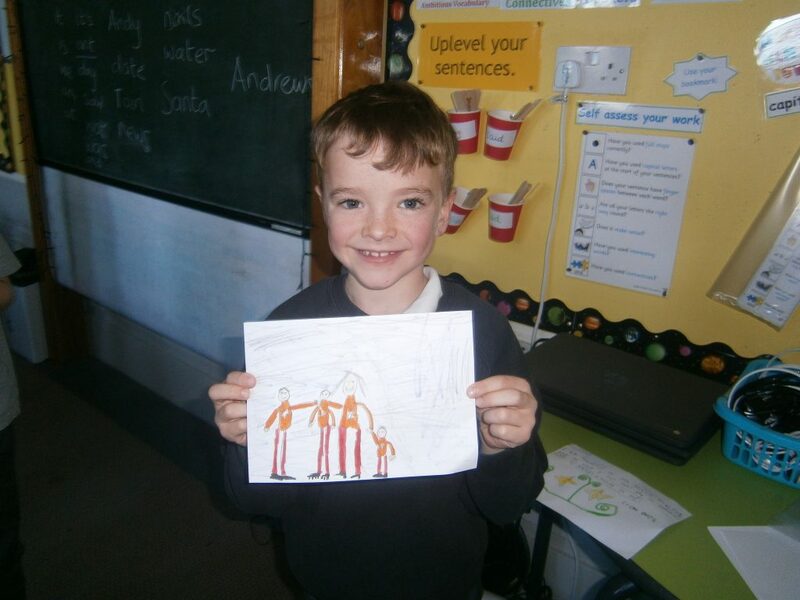 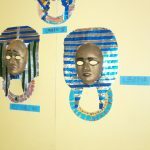 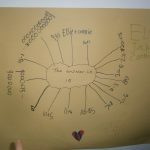 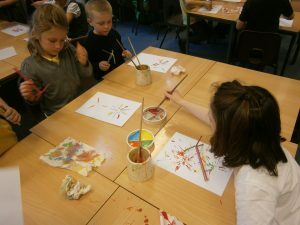 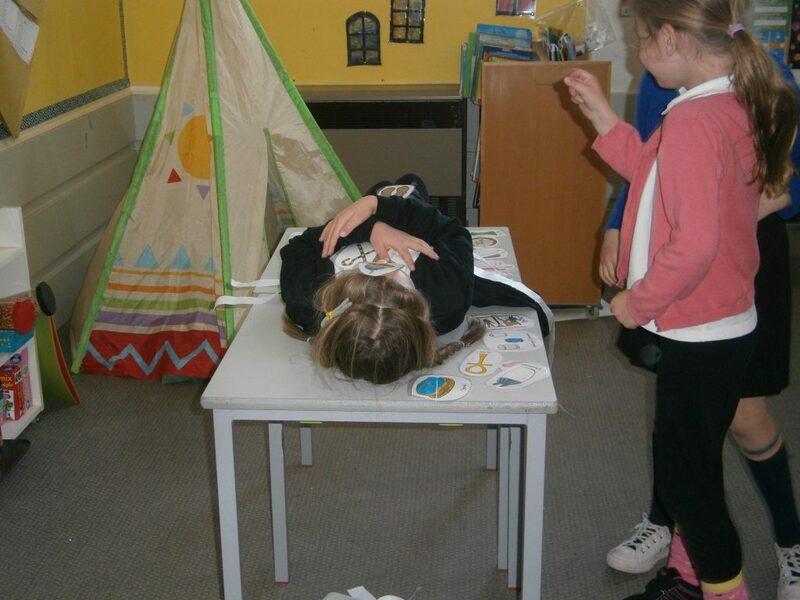 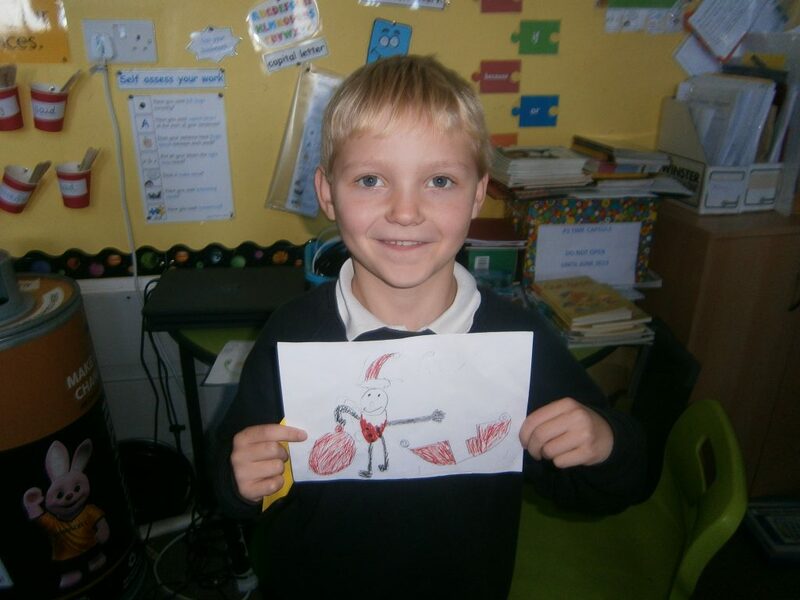 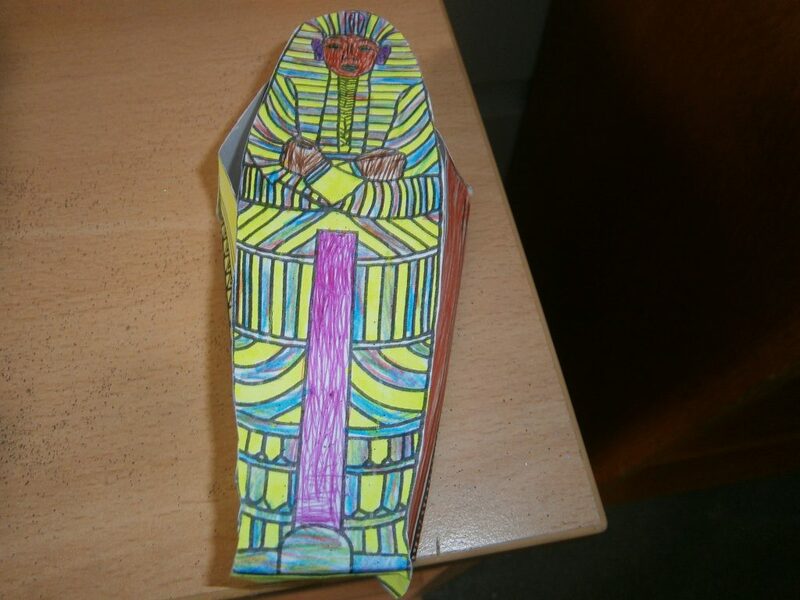 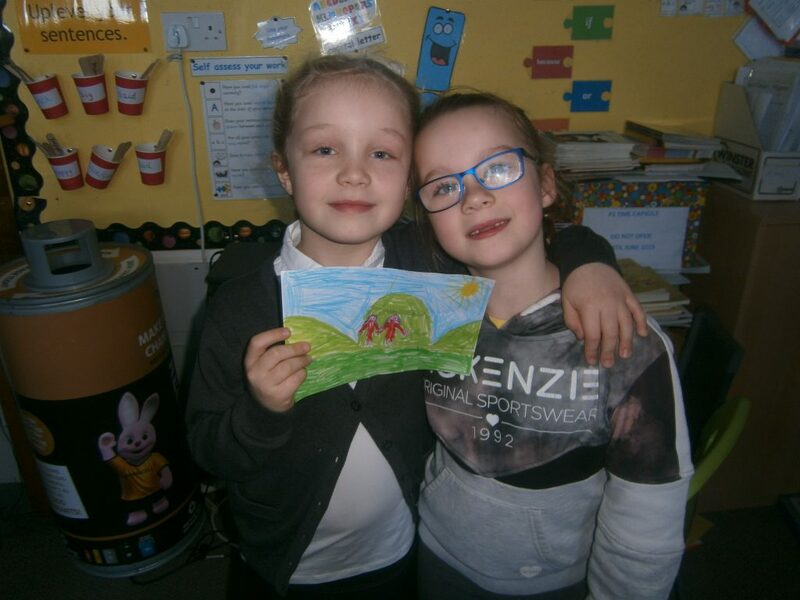 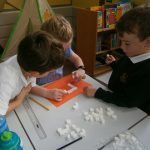 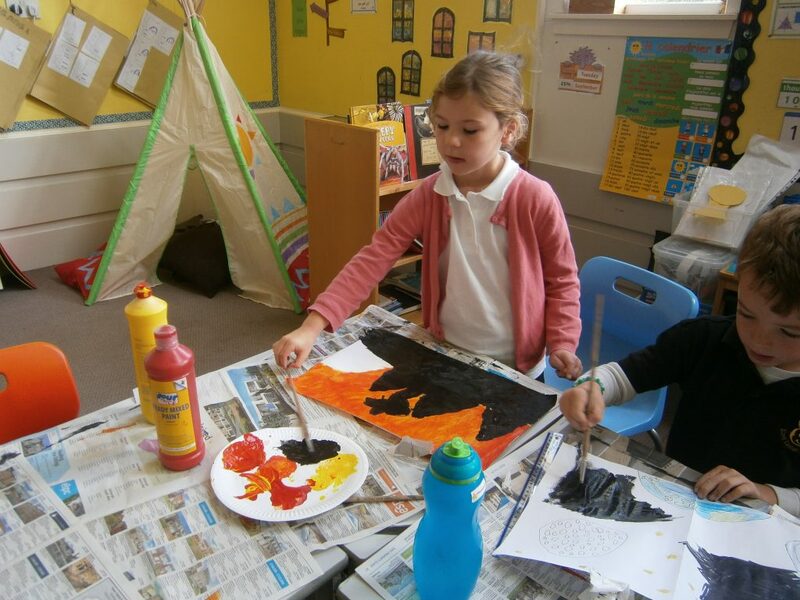 We have been really busy in Primary 5 this past few weeks. 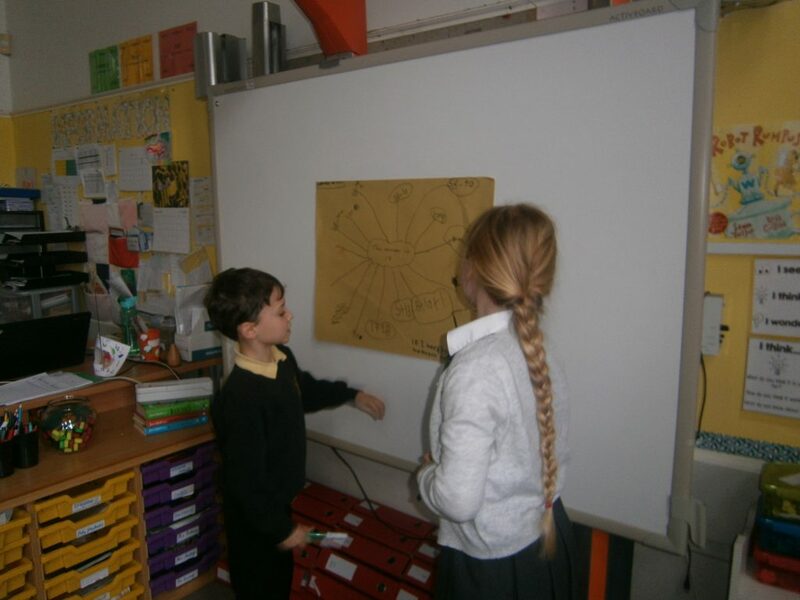 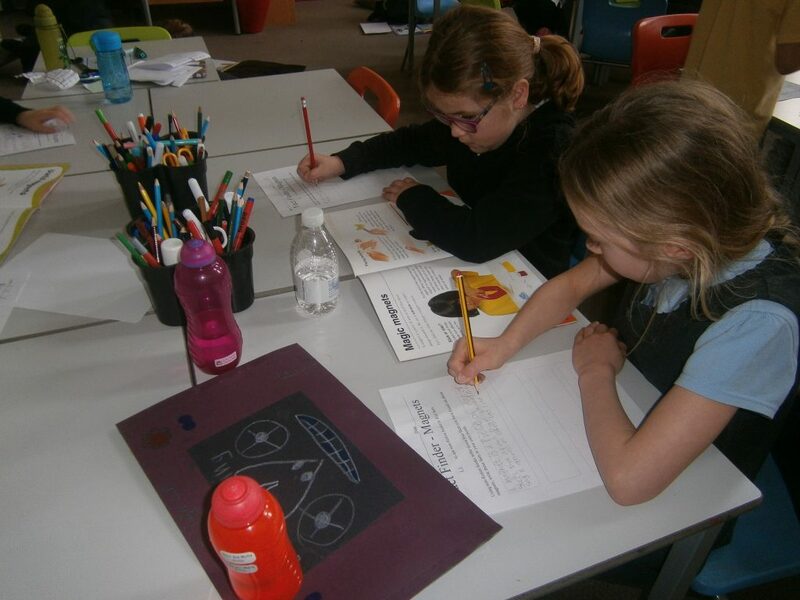 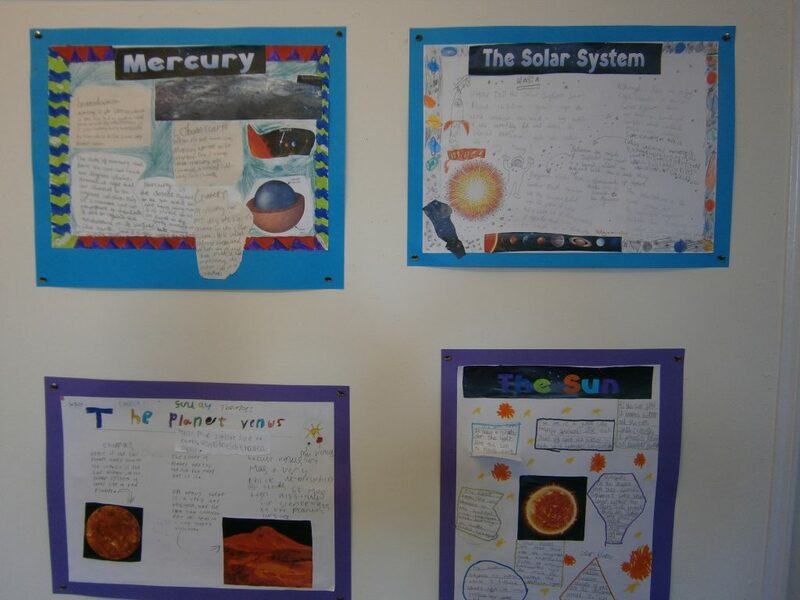 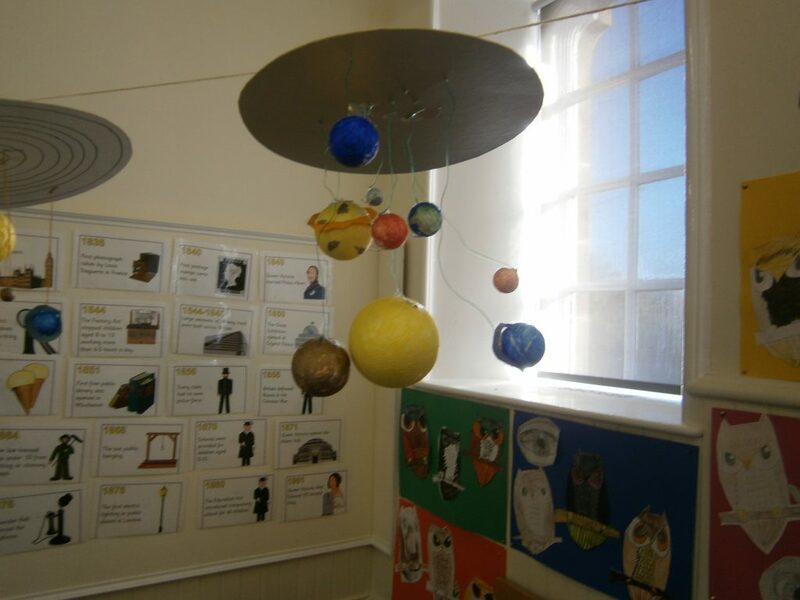 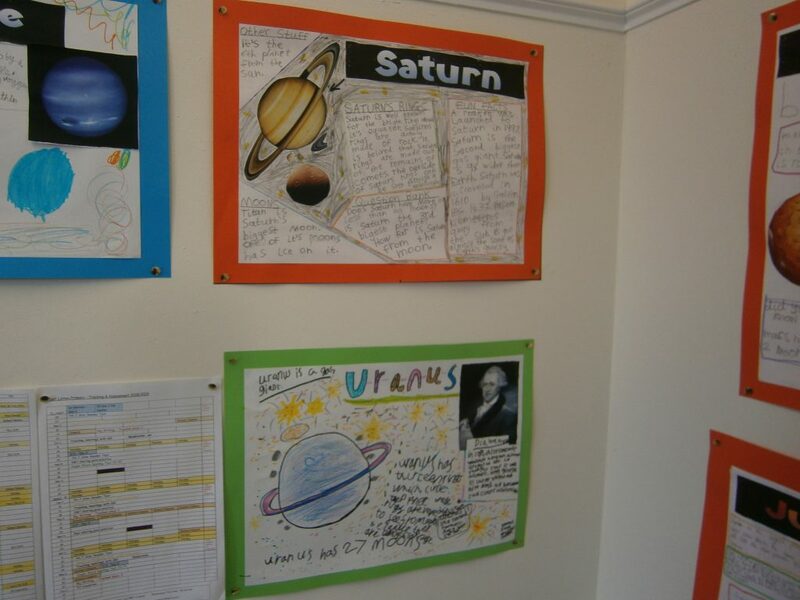 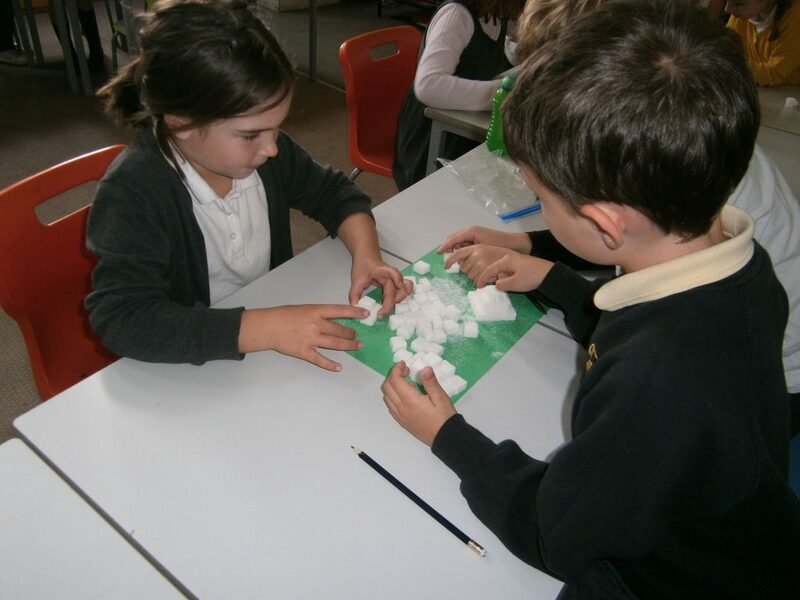 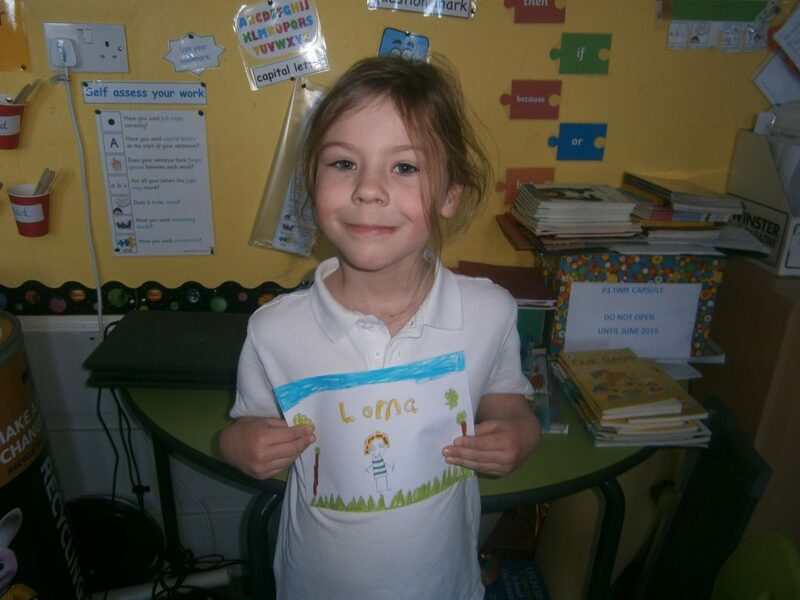 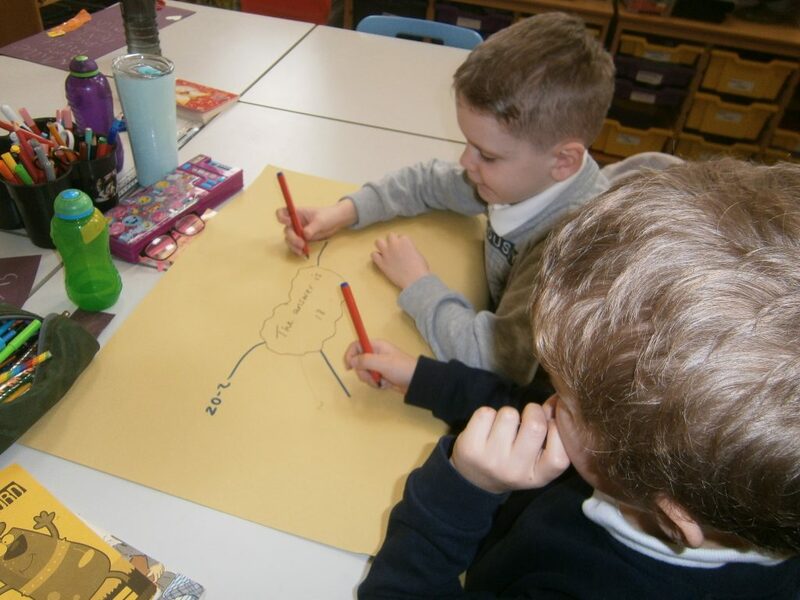 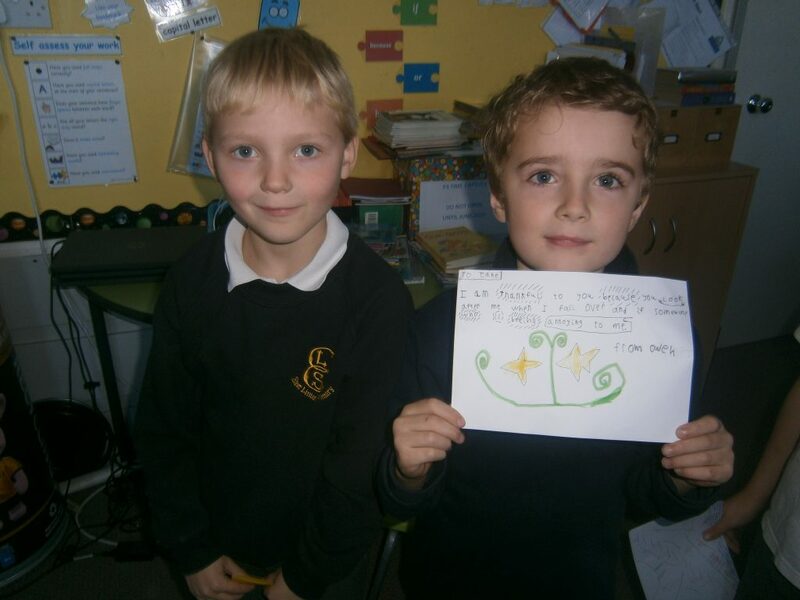 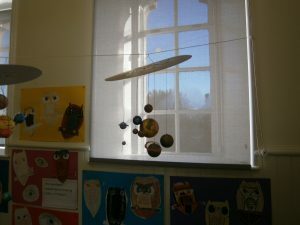 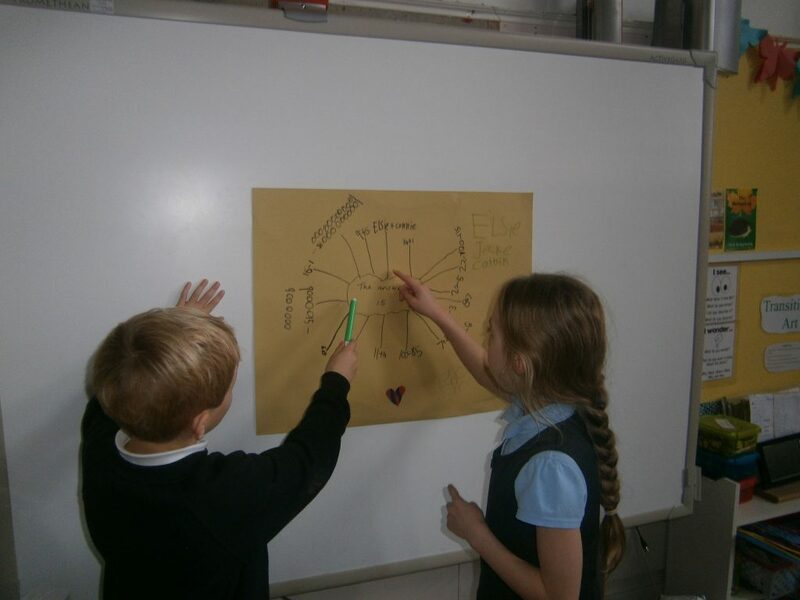 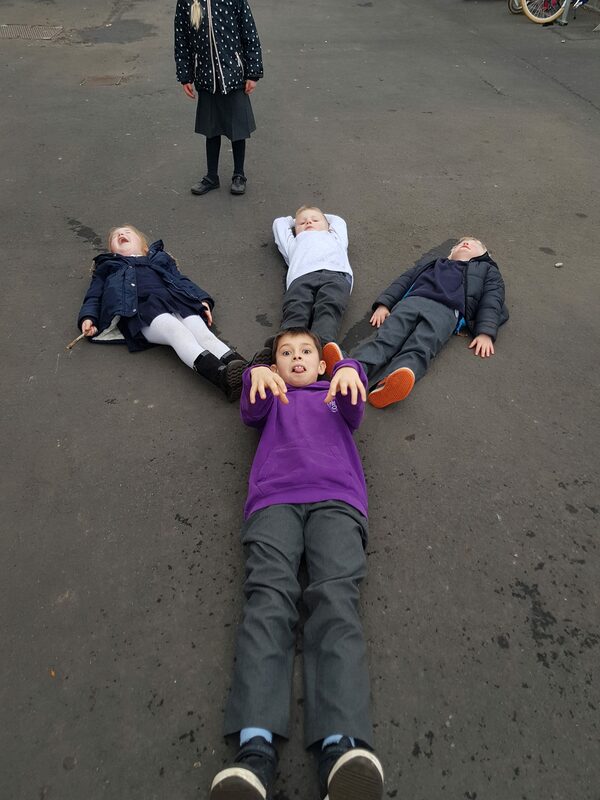 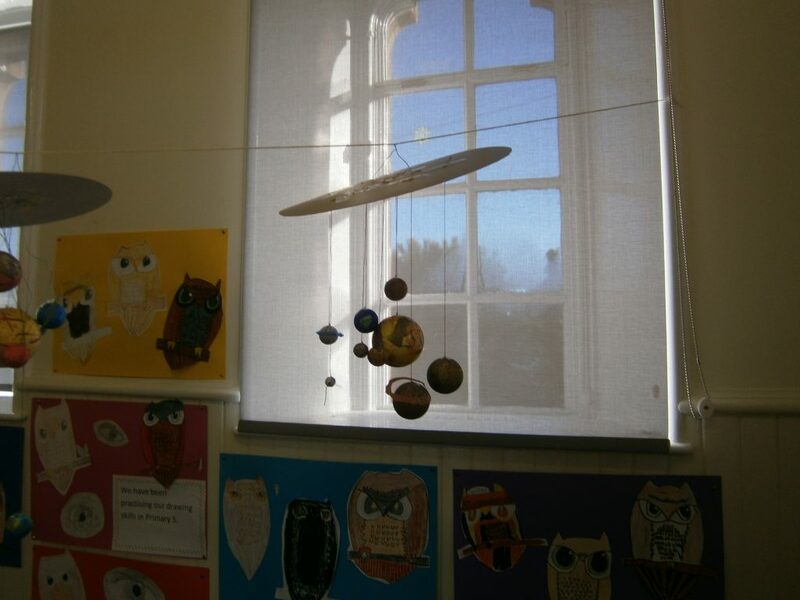 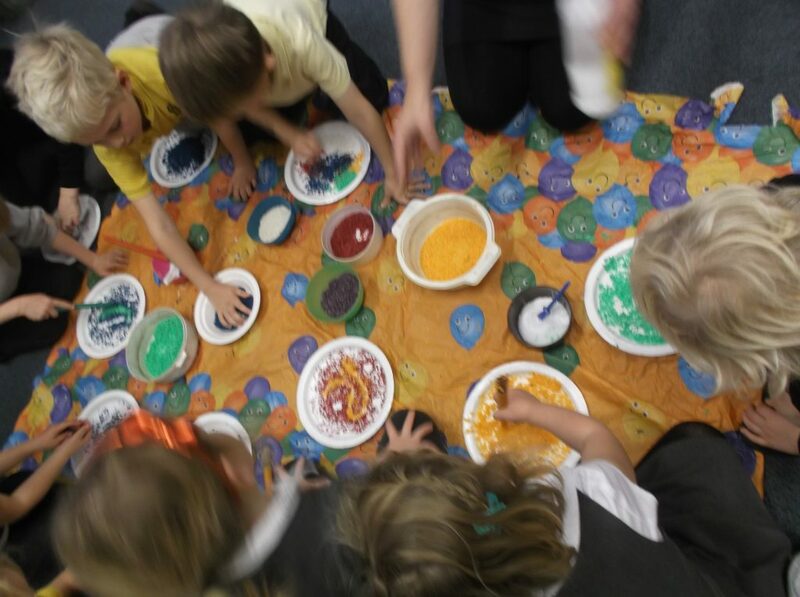 We have been working on the solar system and finding out about individual planets as part of our Space topic. 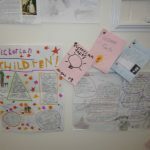 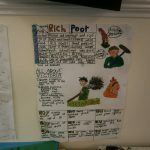 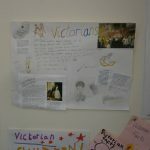 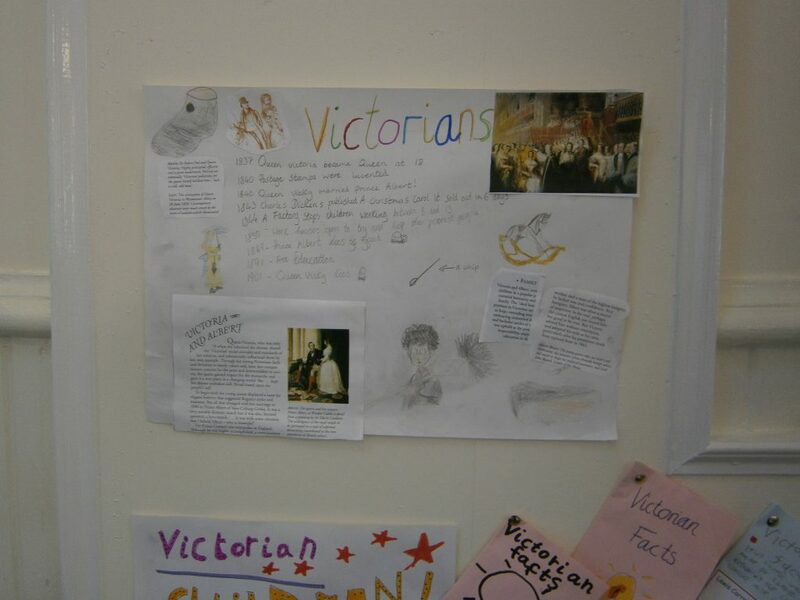 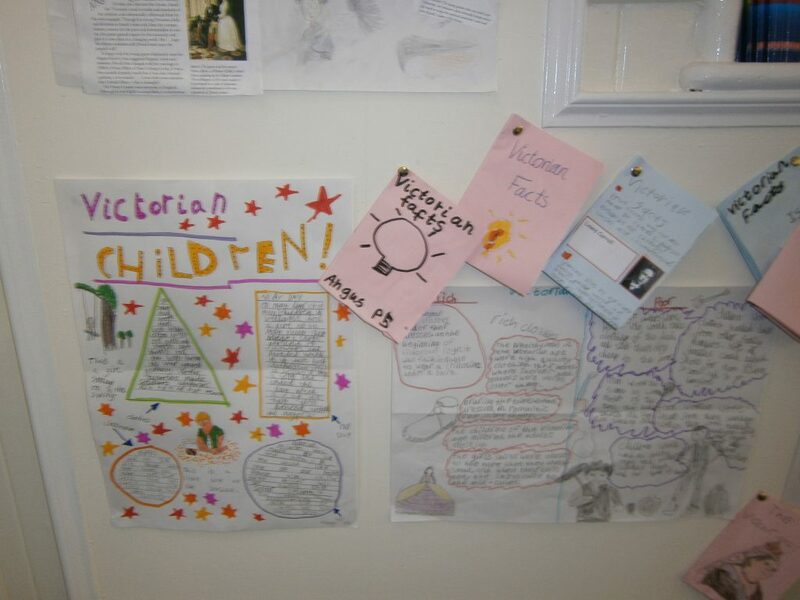 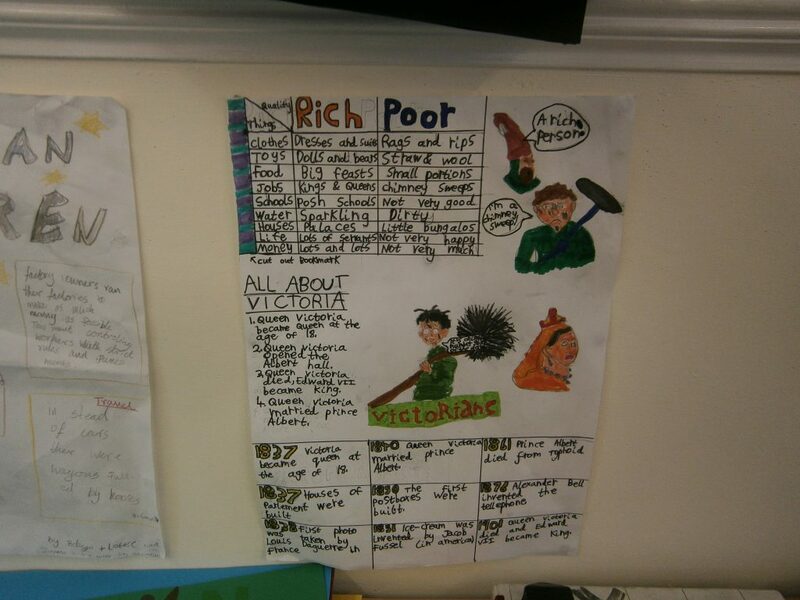 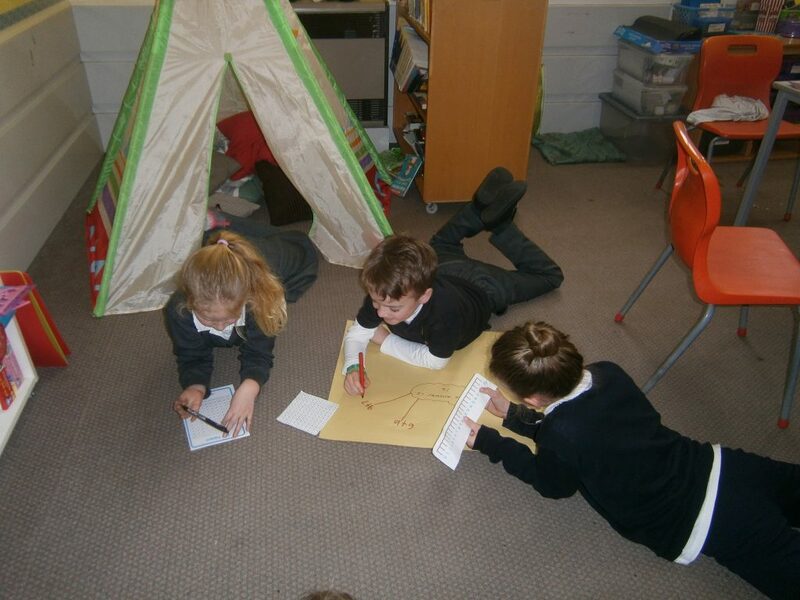 As part of our work on the Victorians we have been looking at the class system and famous Victorian inventors. 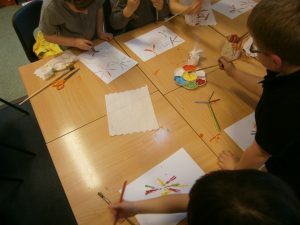 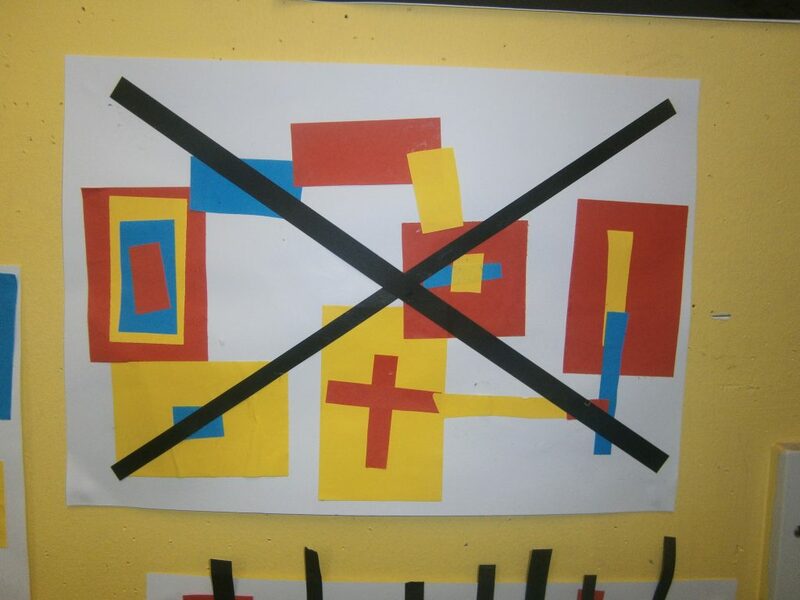 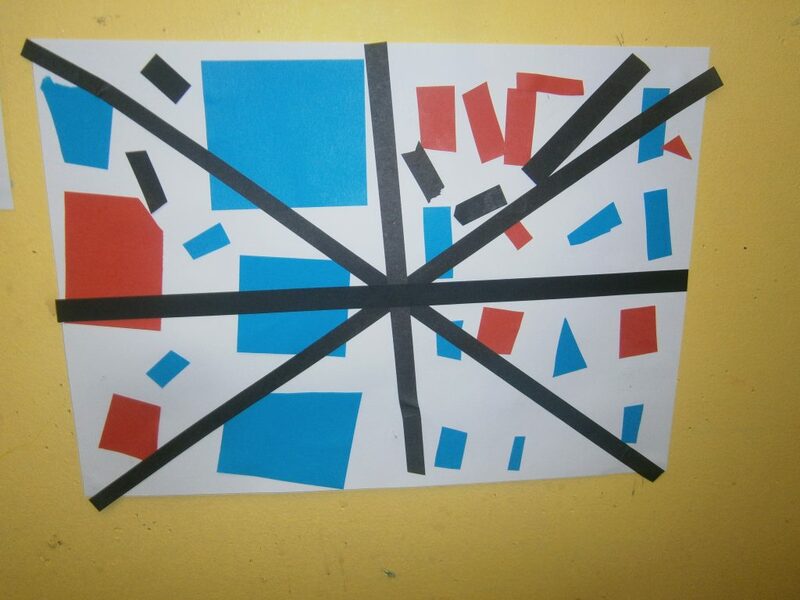 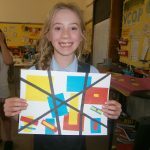 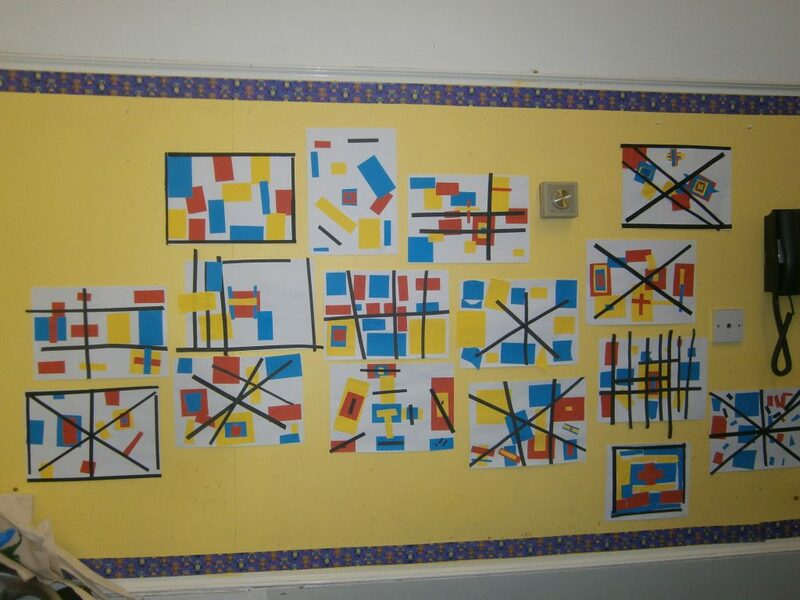 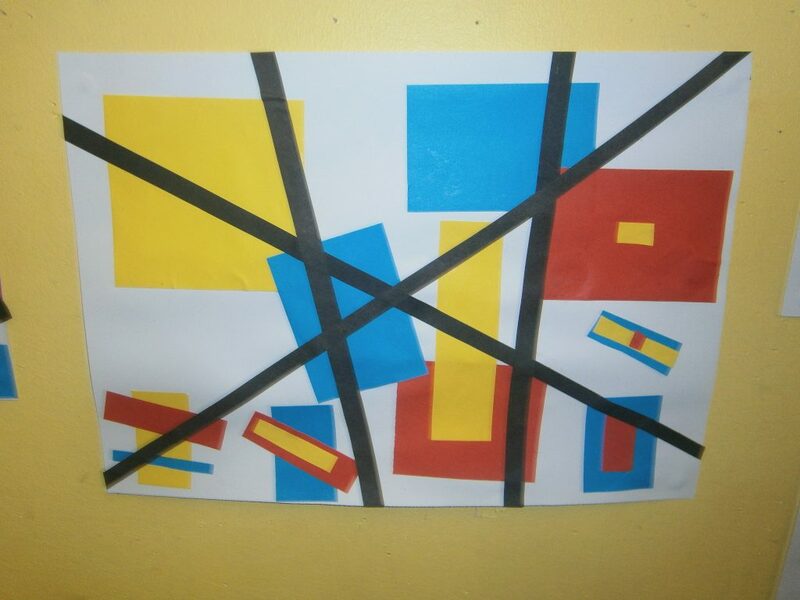 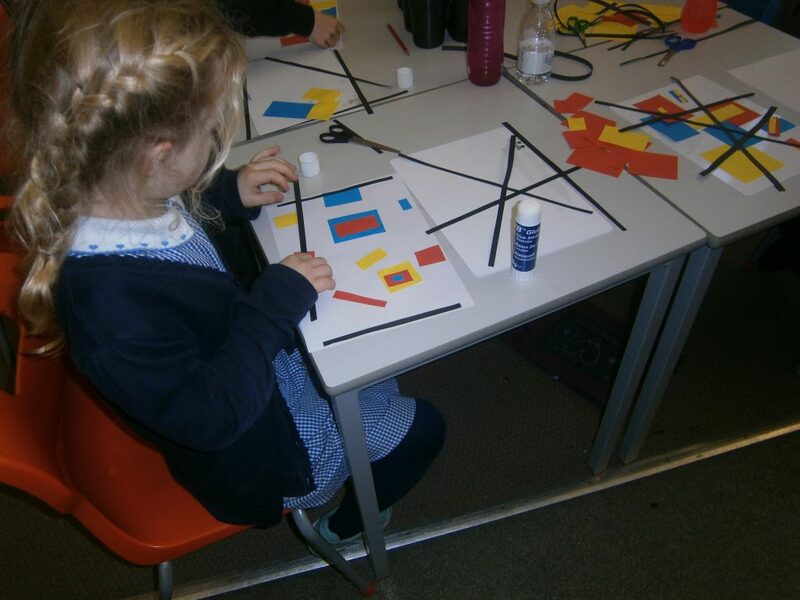 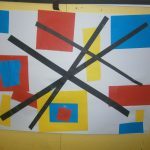 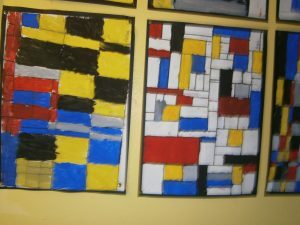 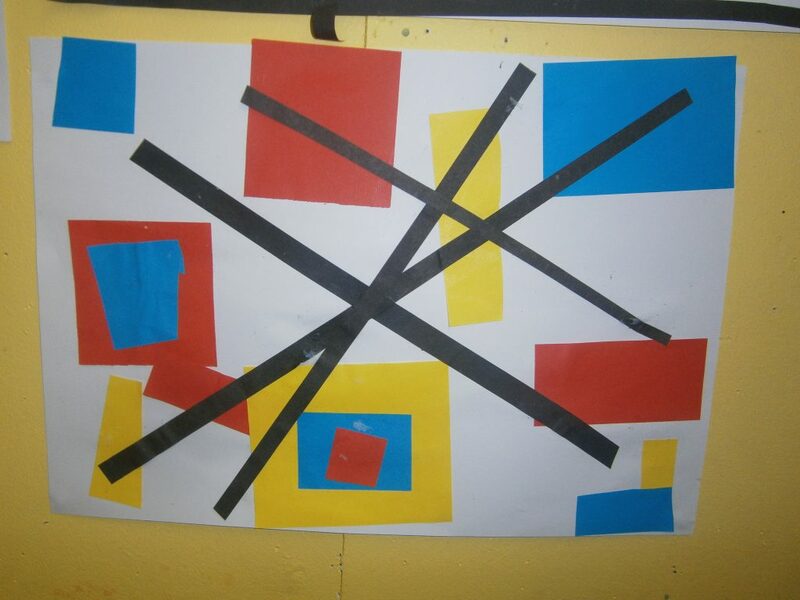 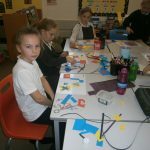 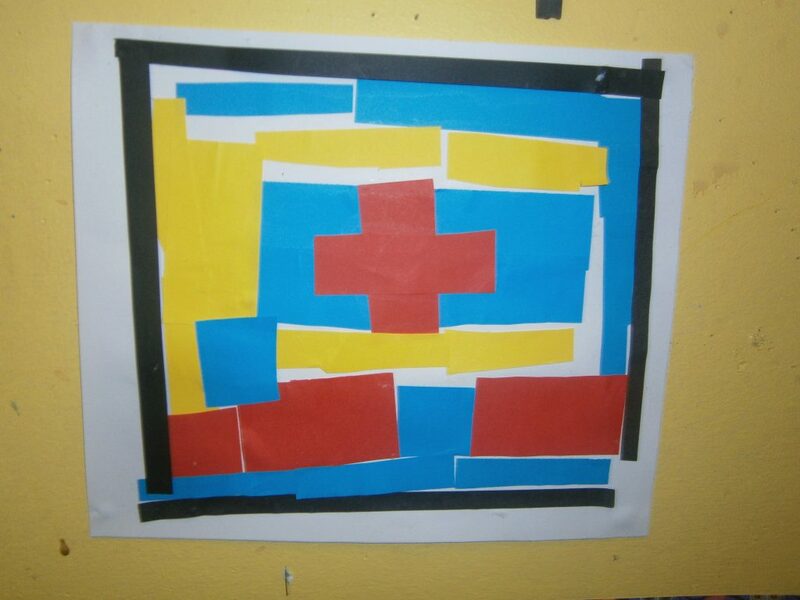 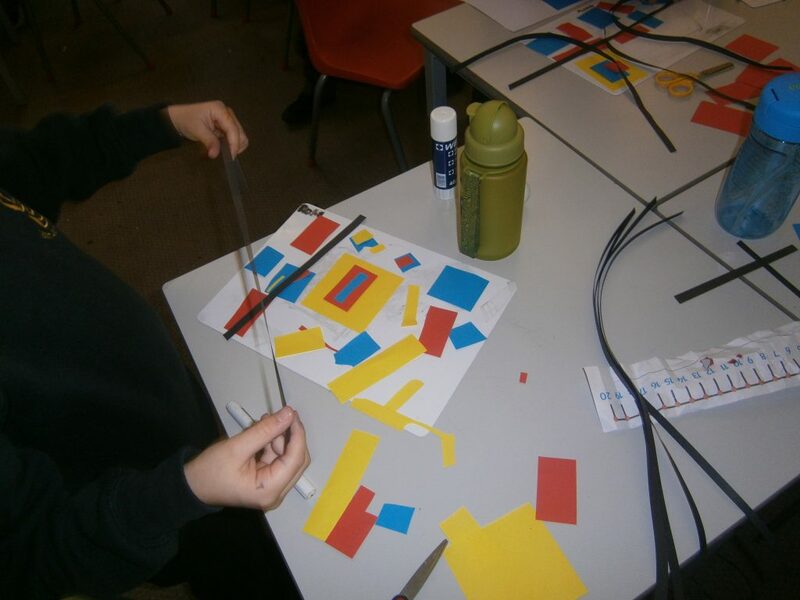 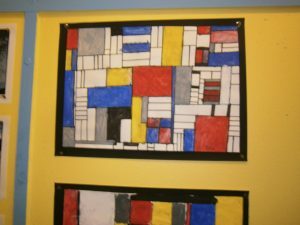 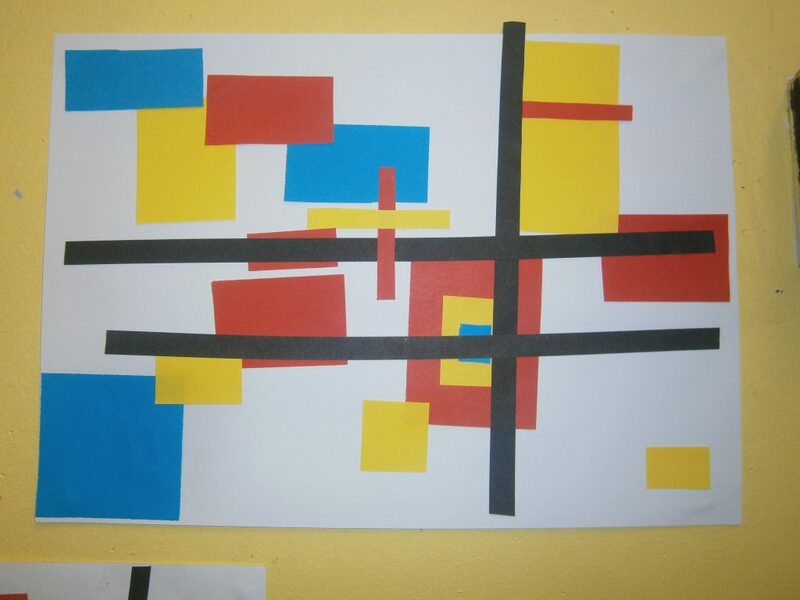 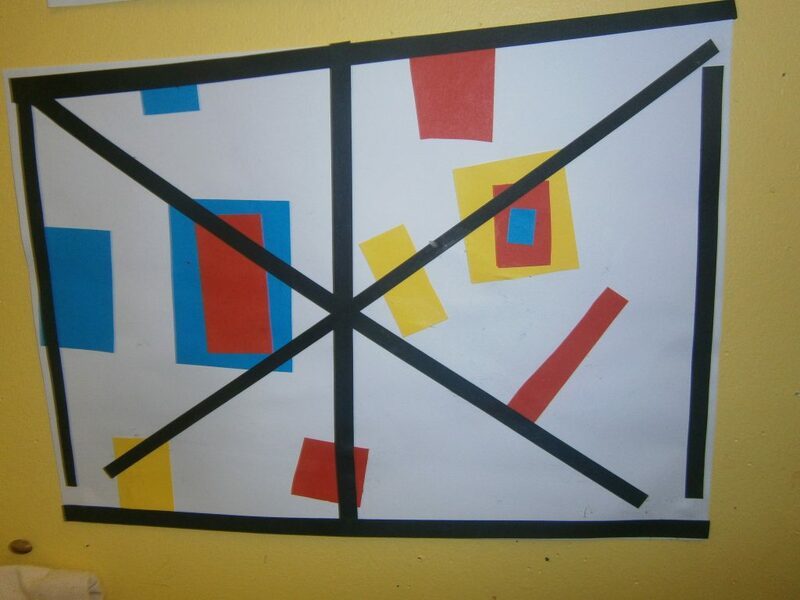 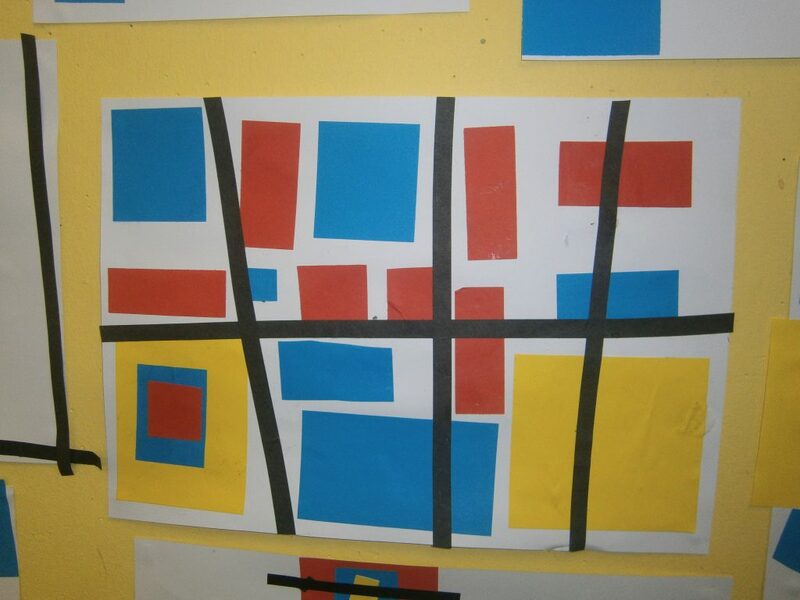 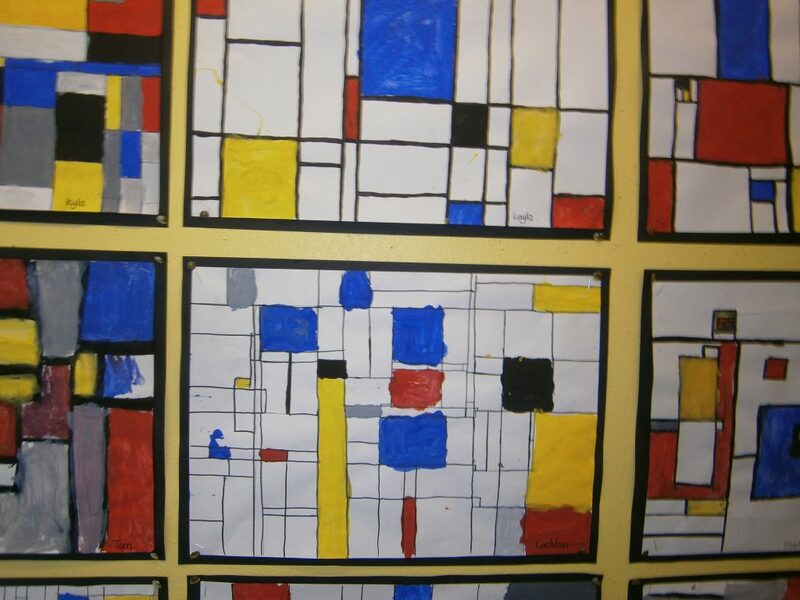 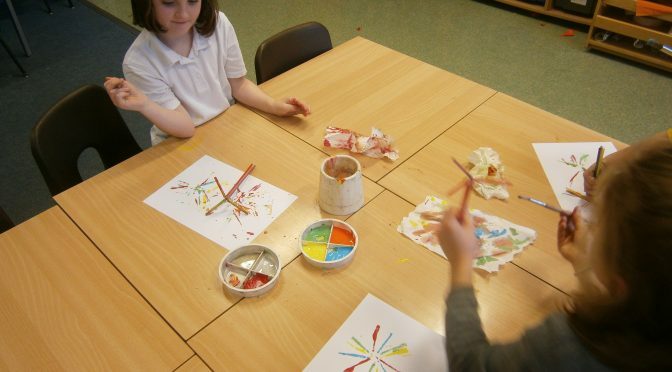 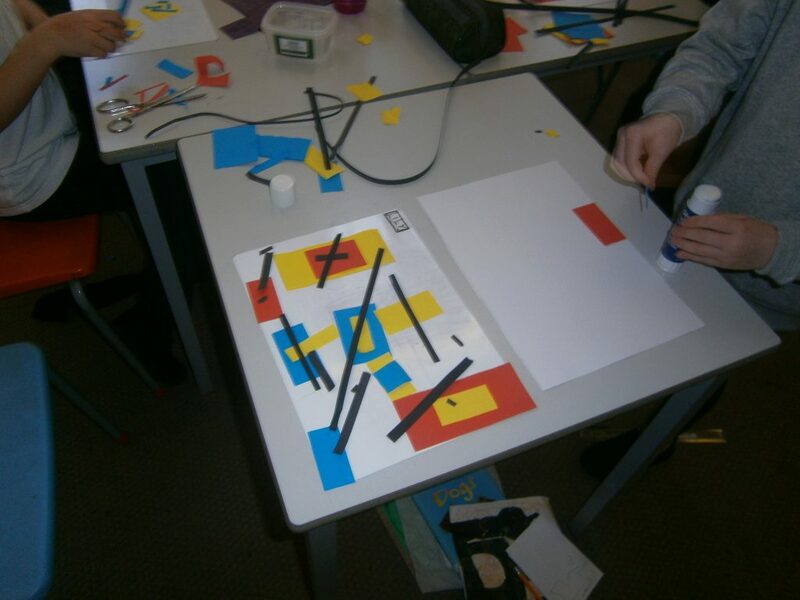 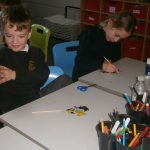 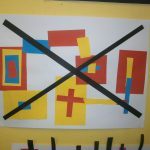 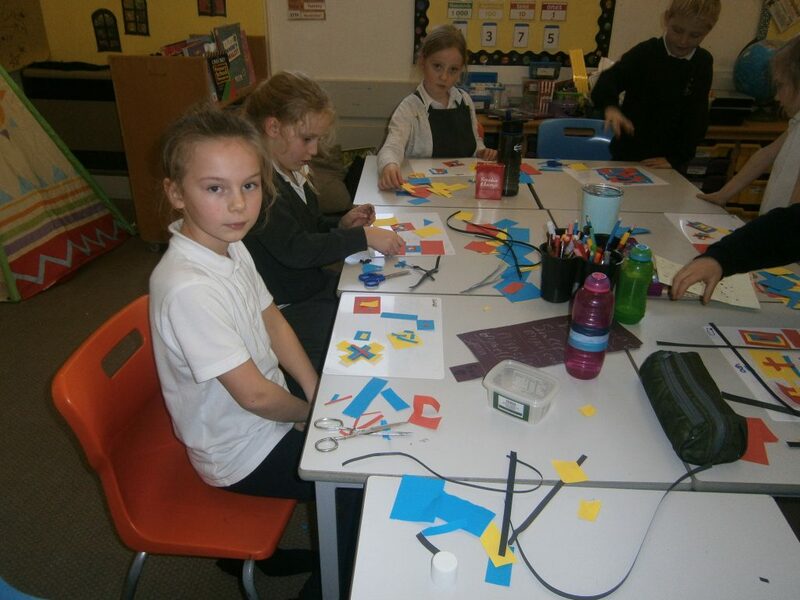 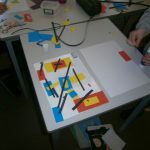 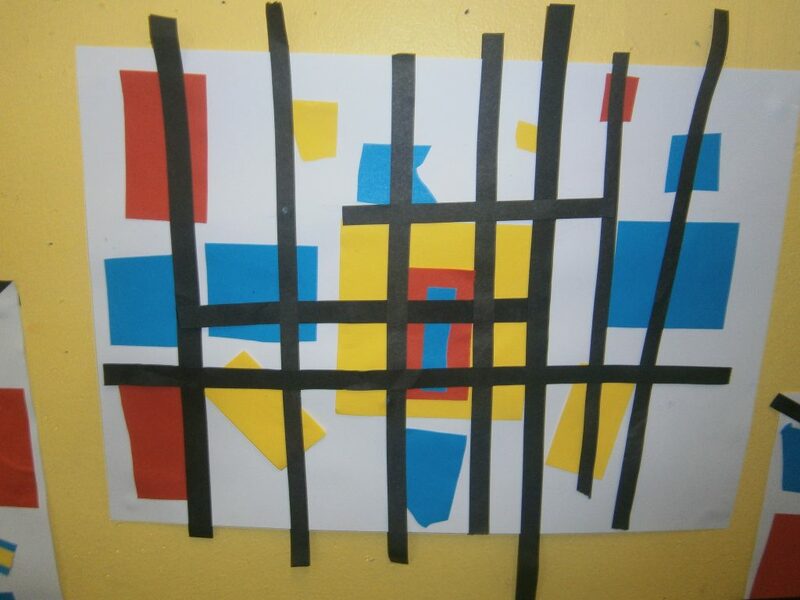 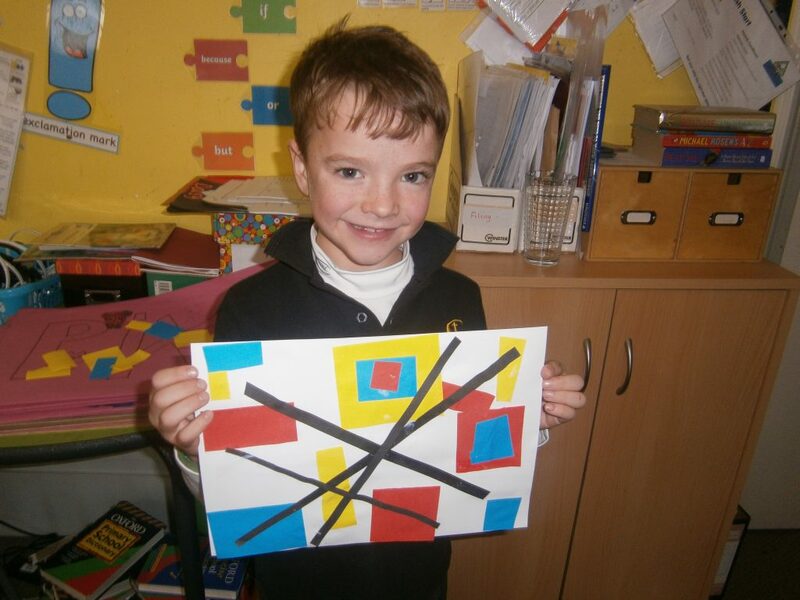 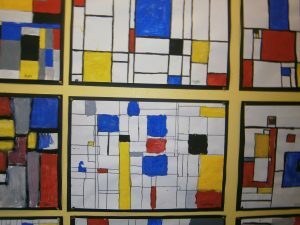 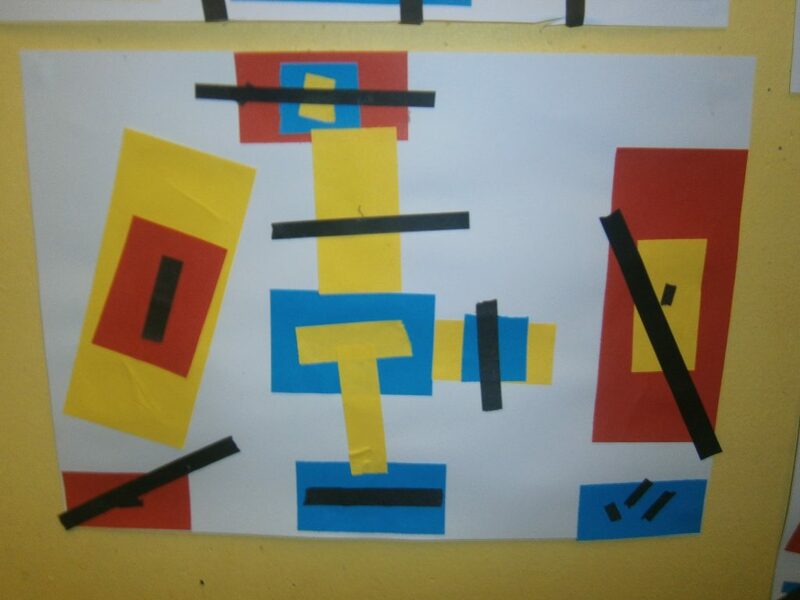 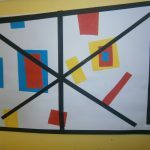 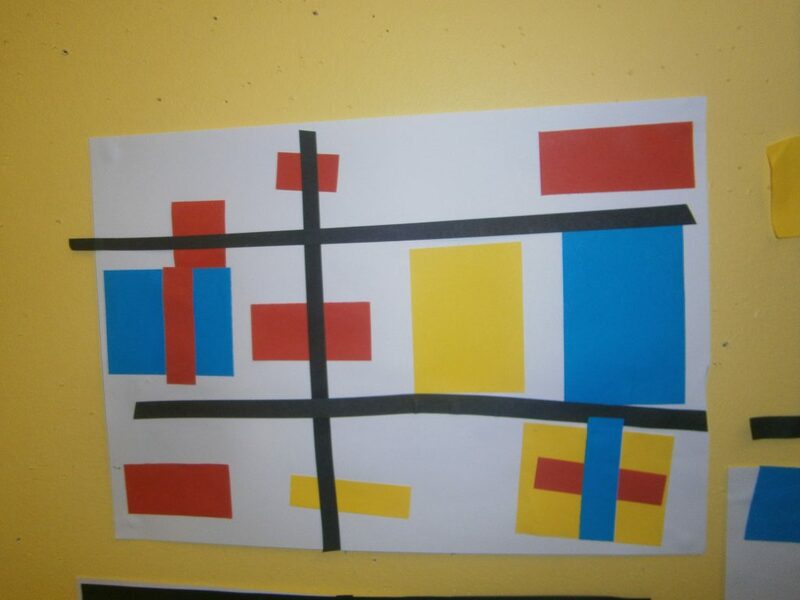 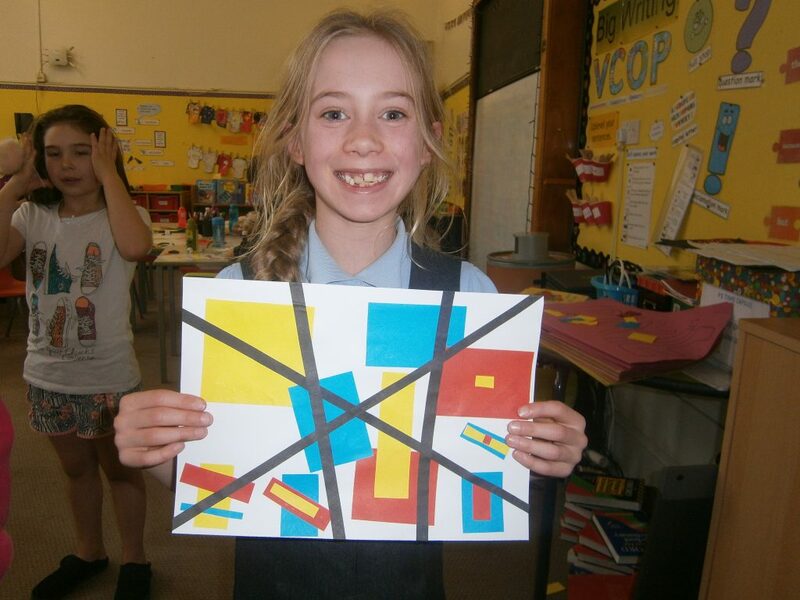 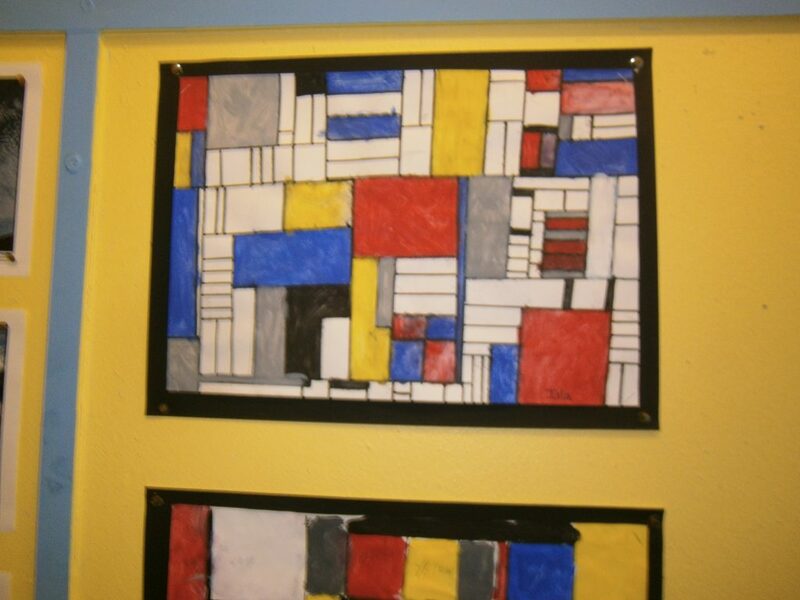 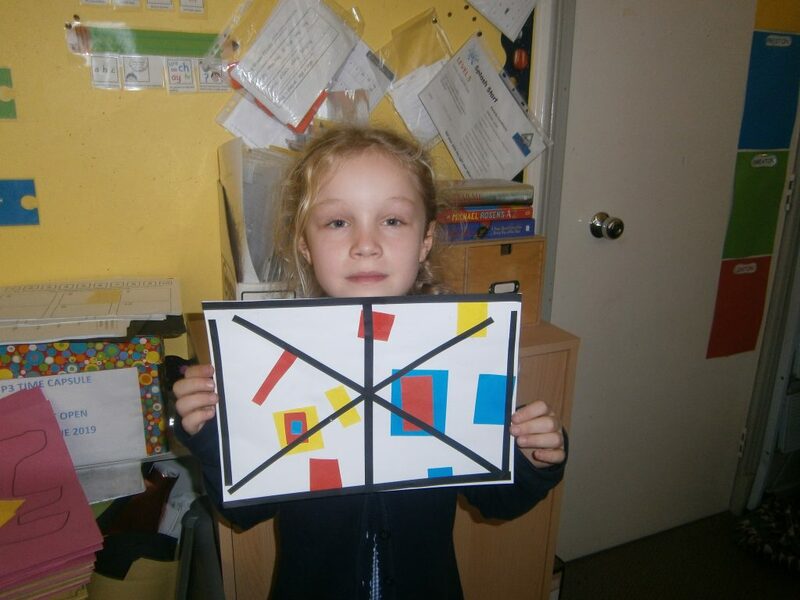 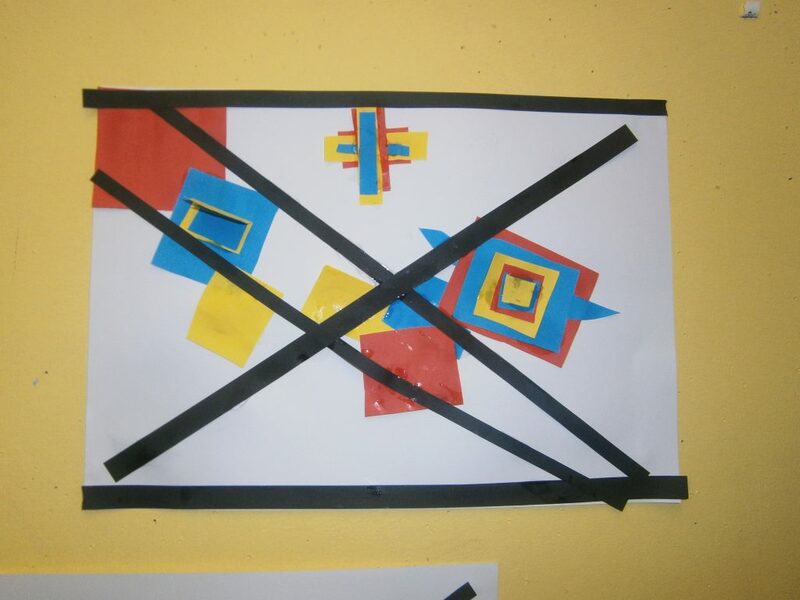 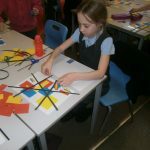 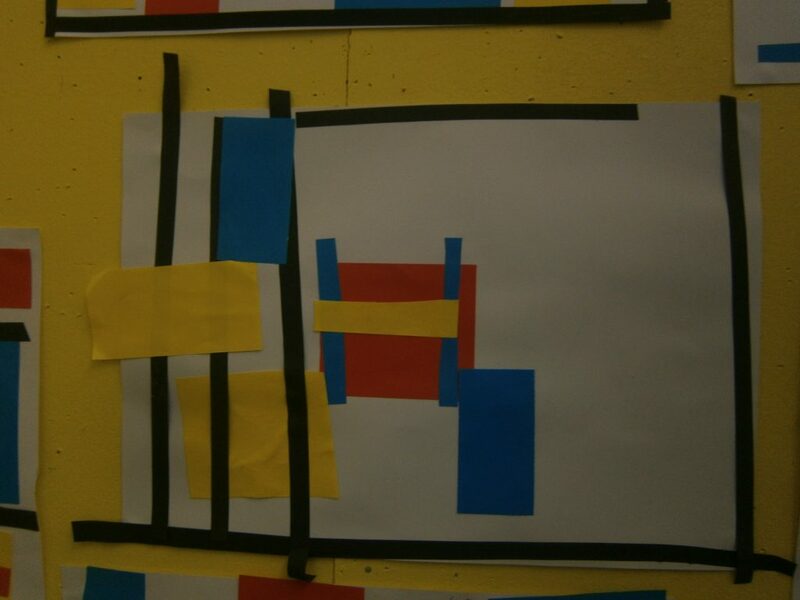 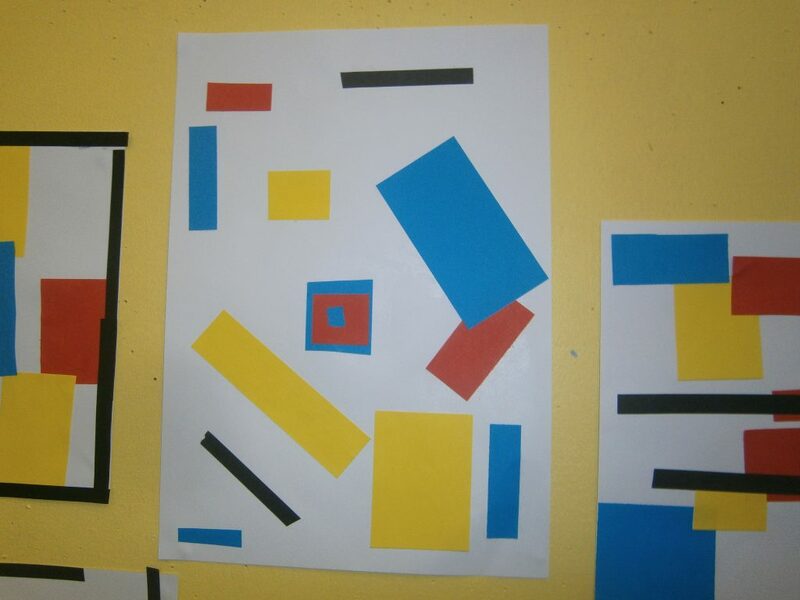 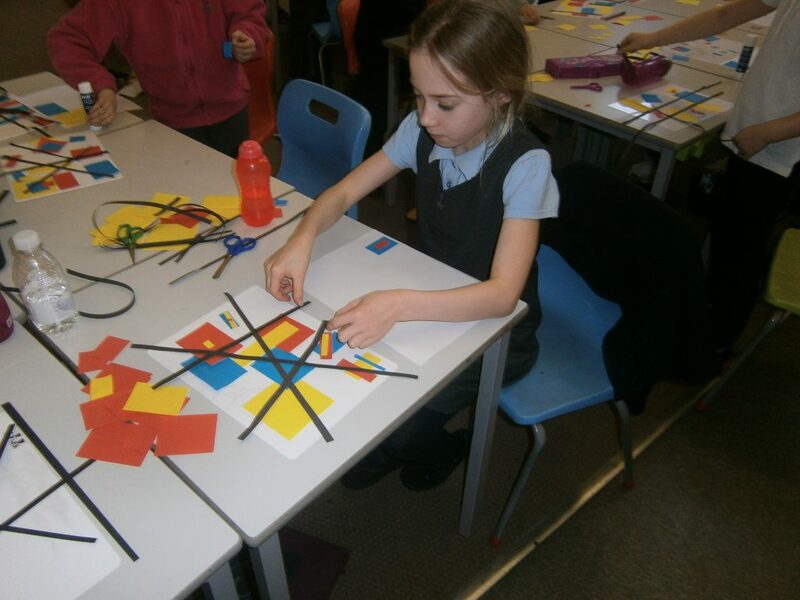 In art we have been looking at the work of Mondrian and trying to emulate his work with line. 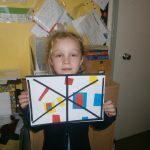 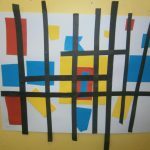 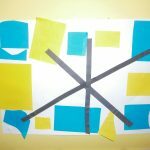 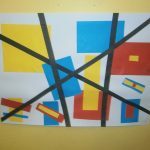 Emulating Mondrian’s work with “Line”.